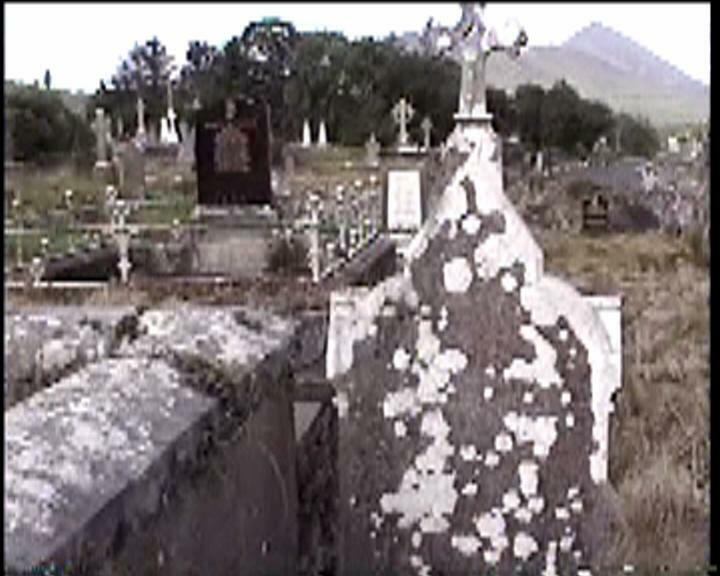 Aughavale (I've heard the locals pronounce it "Uh-wal") Cemetery is located along the south shore of Clew Bay about a mile southwest of Westport heading towards Louisburgh on R335 near Belclare. I found this cemetery by accident late at night while returning from Murrisk after scouting out Croagh Patrick, which we climbed the following day (with shoes). 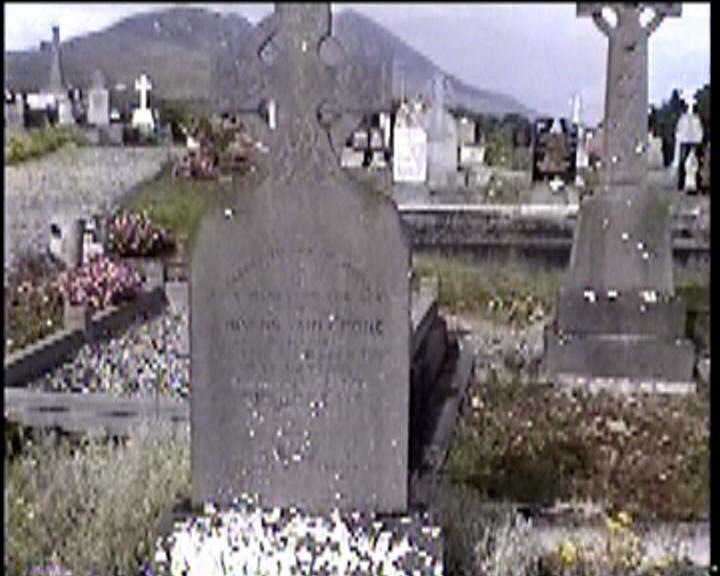 Aughavale is the main cemetery for Westport and is unique in that it has both Catholic and Protestant burials in the same cemetery. There is an older section of the cemetery across the road that I visited at dusk on the clear full-moon night (and it was still light out!) but I forgot to film it when I returned the next day. After reading Yeats' "Fairy and Folk Tales of Ireland" on the flight to Ireland, my senses were tingling as I left the road, hopped the stone wall, and climbed through the old cemetery with the little voice in my head saying "Don't go in there...". Even though it was almost midnight, it was still light enough to make my way through the cemetery and I spent about 30 minutes climbing over graves, blessing myself every few minutes as I stepped over my ancestors. It was a spooky feeling and more than once the hair on my arms and neck stood up as I "felt" things, spirits, a surreal presence. Definitely one of the highlights of my vacation in Ireland! The cemetery is boxed in by a stone wall along the main road, a stone wall on the left side (looking from the street), and another stone wall along a smaller road on the right which contains the main entrance. The newer section is located to the right of this main entrance. 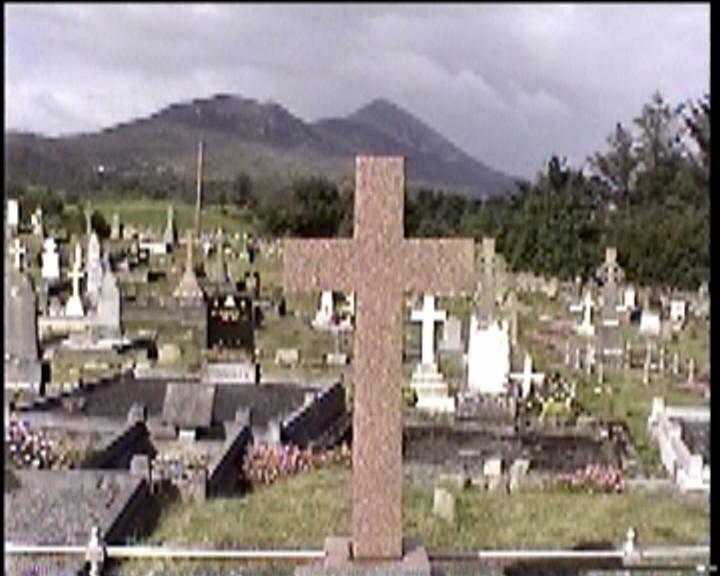 In general, this is a very cool cemetery with many tall celtic crosses, ruins of a church, and lots of old graves all in the shadow of Croagh Patrick. 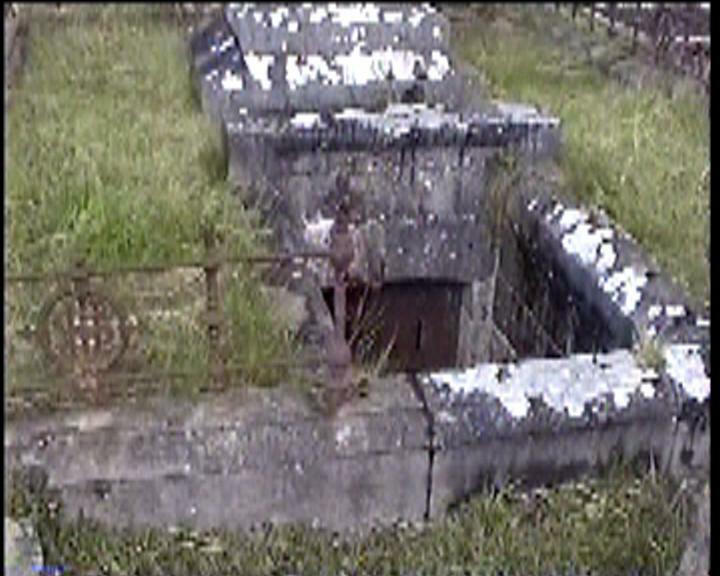 The graves and headstones in the older section are scattered across hilly, rocky ground and it was difficult to film in any pattern. I met the caretaker (Jim McNally) who showed me a few of the Gill graves and gave me directions to Kilmeena Cemetery to look for my "island people". He had a master list of all of the graves that I would have loved to get a copy of although I did take a snapshot of the Gill page. 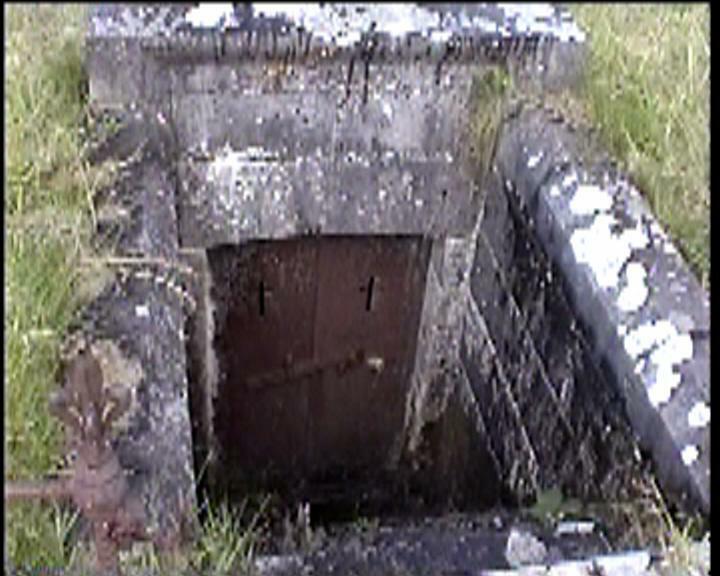 One of the wildest graves I saw there was the "basement mausoleum". I saw this on my midnight tour but didn't have the guts to see if the door was open. When I came back the next day, I found out it was although I still didn't go in. No pattern to my travels through this graveyard. I managed about 80 transcriptions, mostly in the newer section. 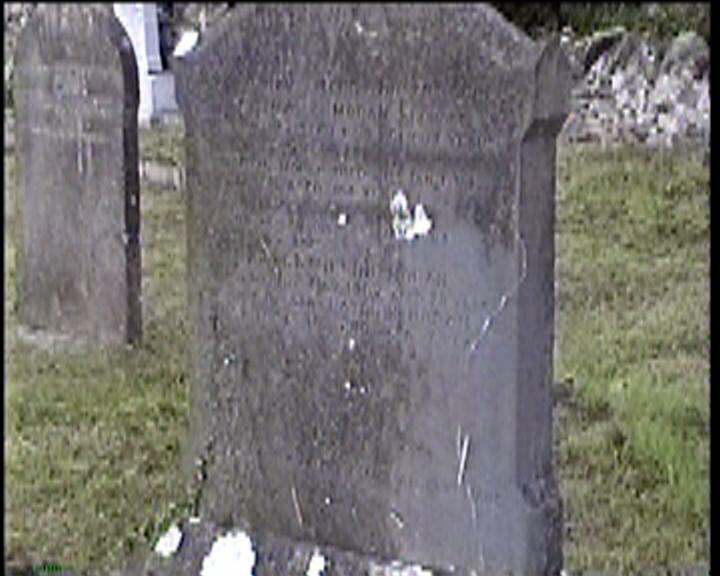 Many of the headstones in the old section went back into the 1800's and were very difficult to read. 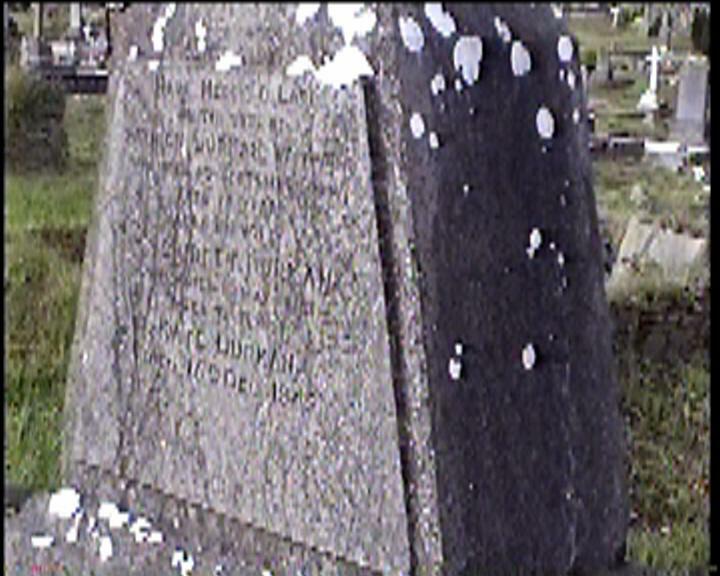 Click on the number of the grave to see a video capture picture of the headstone. Also check out some of the random pictures from this cemetery here. Have Mercy O Lord … PATRICK DURKAN Westport died Sept… aged 74 years. And his wife BRIDGET DURKAN .. May?. 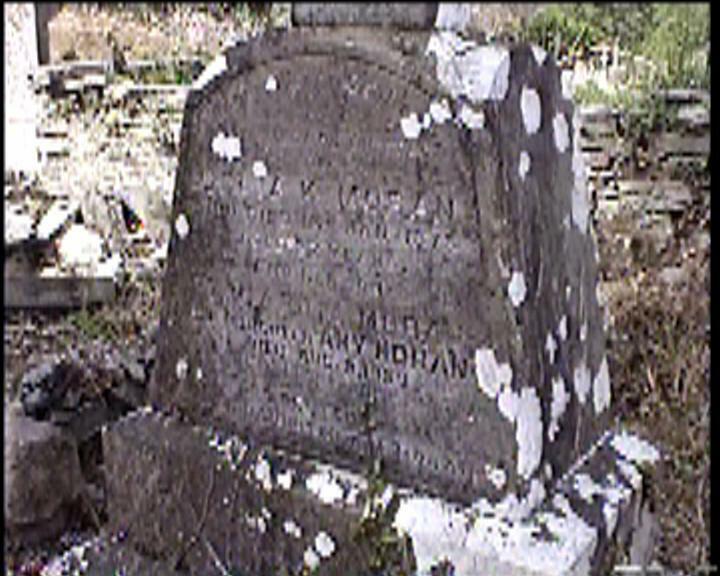 KATE DURKAN died 16th Dec. 1842. In Loving Memory of MAREE GILL 18.12.1953 – 26.01.1955. ELIZABETH GILL 13.31.1892 – 28.12.1976. PIERCE GILL 19.06.1919 – 29.01.1986. FRANK R. GILL 02.08.1921 – 05.11.1999. Ashes scattered at base of Croagh Patrick. Have mercy on the soul of ANDREW GILL, died 23rd Jan. 1909 aged 43 years. ANTHONY J. GILL, died 7th Dec. 1942. 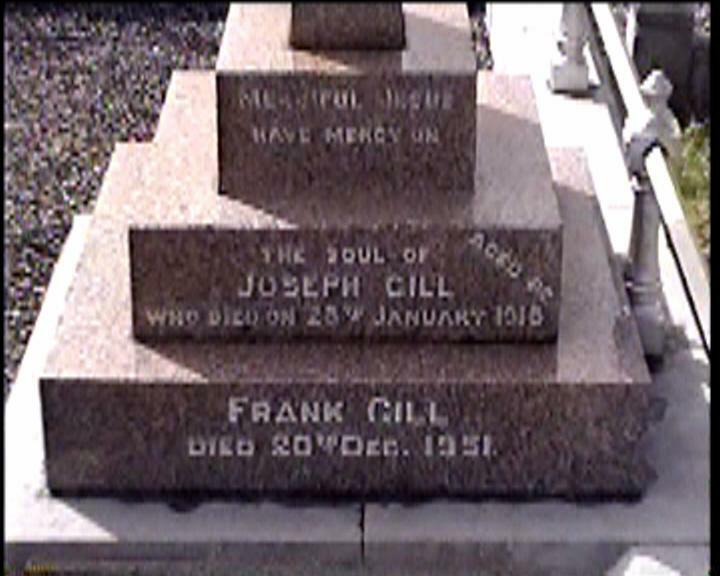 Merciful Jesus have mercy on the soul of JOSEPH GILL who died on 28th January 1918 aged 82. FRANK GILL died 30th Dec. 1951. 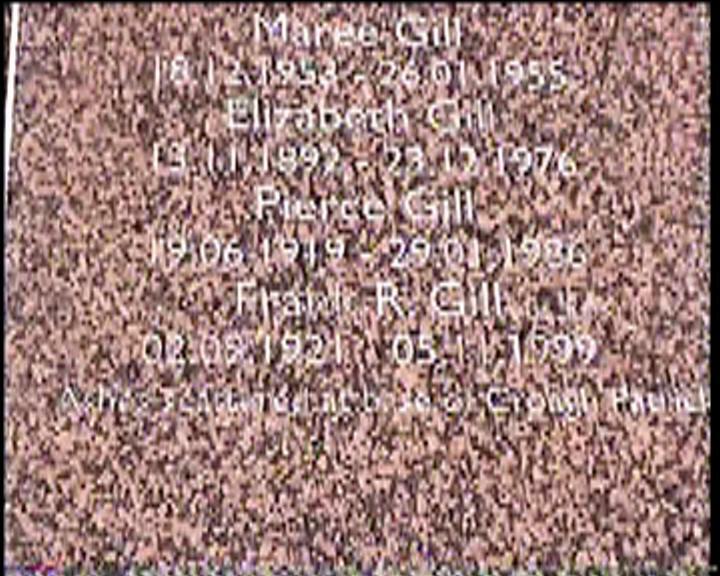 ELIZABETH (LIL) GILL died 23. Dec. 1976. 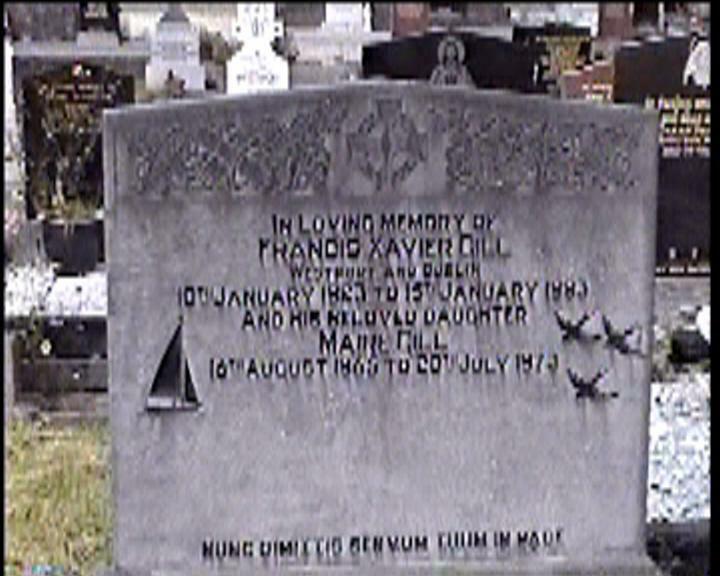 MARY B. GILL died 21st Nov. 1946. 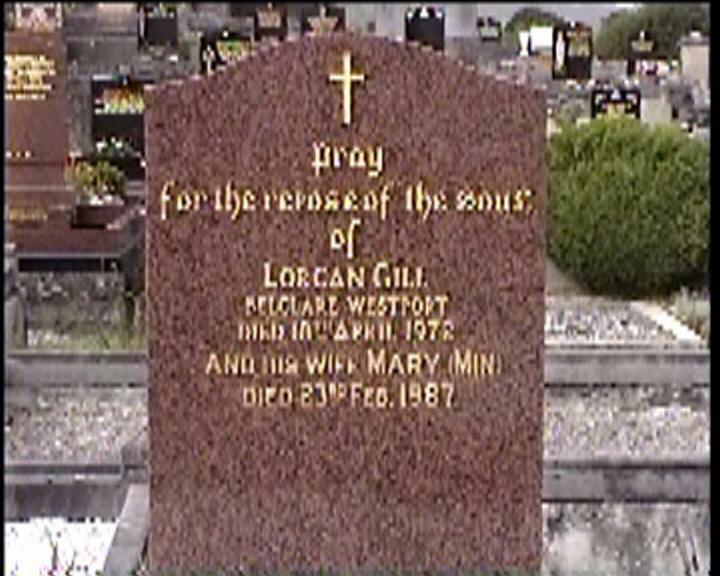 Pray for the soul of LORCAN GILL Belclare Westport. Died 18th April 1972. 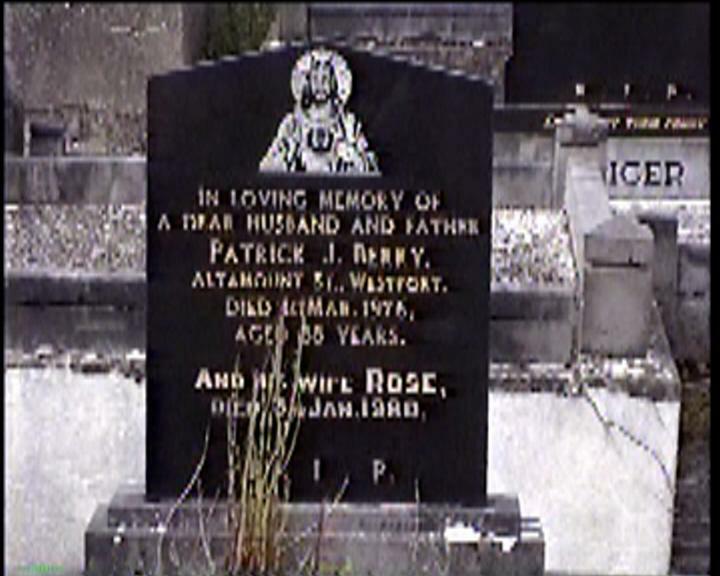 And his wife MARY (MIN) died 23rd Feb. 1987. In loving memory of FRANCIS XAVIEW GILL Westport and Dublin. 18th January 1923 to 15th January 1993. And his beloved daughter MAIRE GILL 16th August 1965 to 28th July 1973. In loving memory of PATRICK GILL, The Quay, Westport. Died Nov. 3, 1952, and his wife AGNES died Jan. 28, 1949. And their daughter PATRICIA died 15th July 1971. 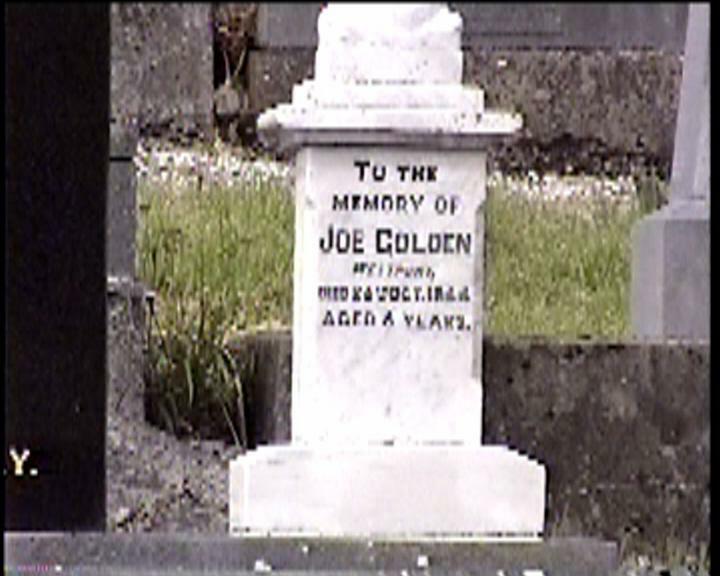 Erected by their son JOE and daughter PATRICIA. 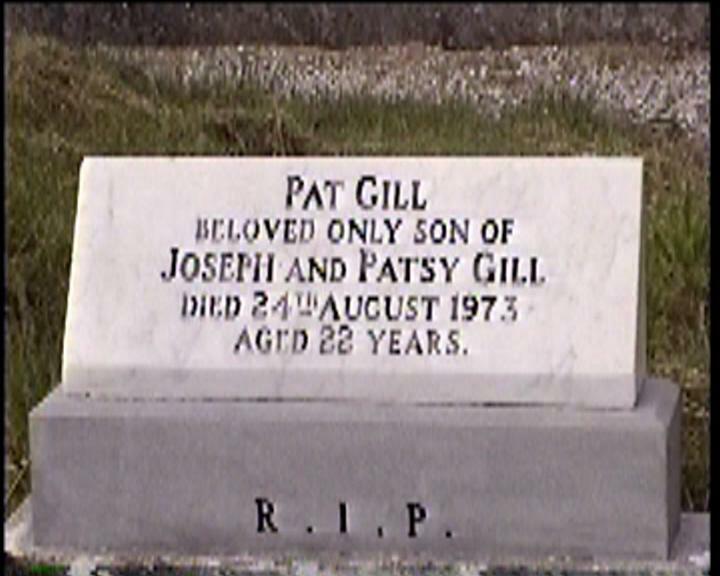 PAT GILL beloved only son of JOSEPH and PATSY GILL. Died 24 August 1973 aged 22 years. 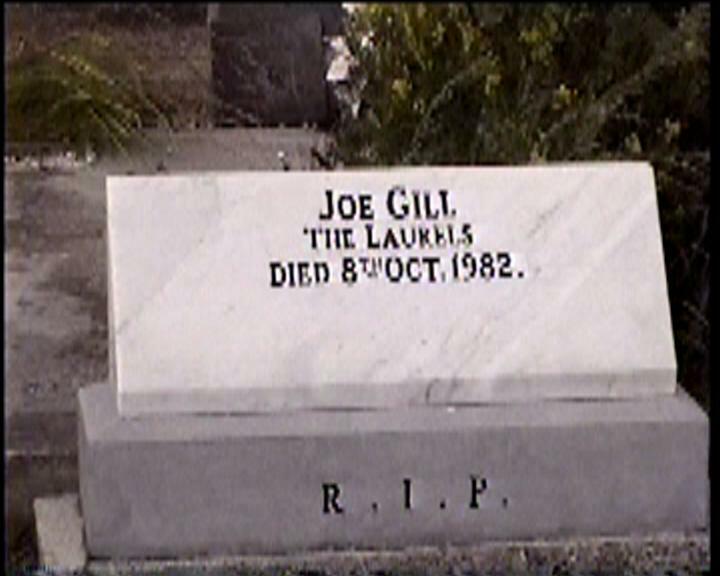 JOE GILL The Laurels. Died 8th Oct. 1982. 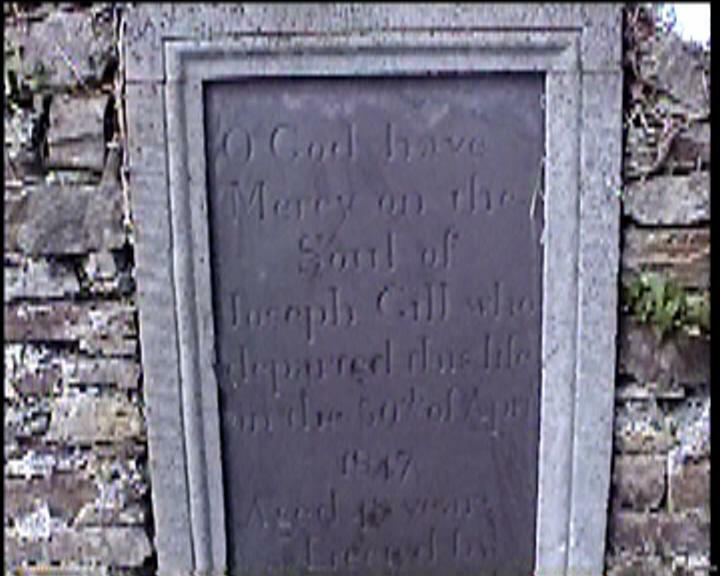 O God have Mercy on the Soul of JOSEPH GILL who departed this life on the 30th or April 1847 Aged 48 years. Erected by his Loving wife Elenor Gill alias Regan. 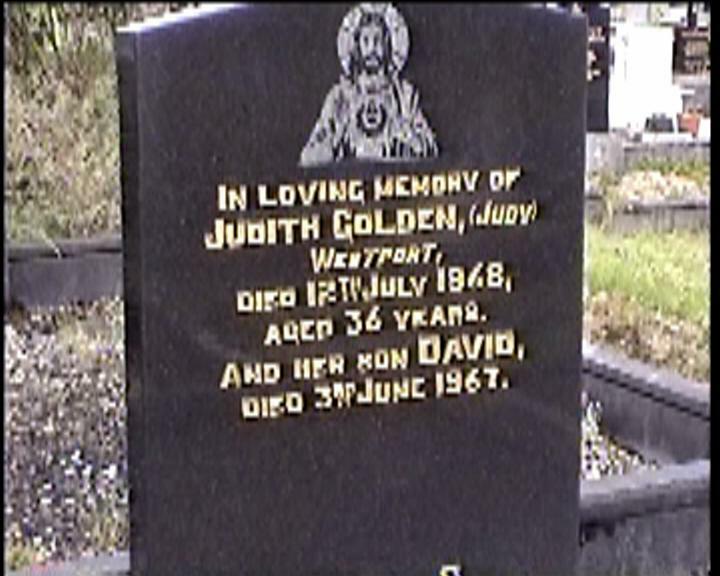 In loving memory of JUDITH GOLDEN, (JUDY) Westport, died 12th July 1968, aged 36 years. And her son DAVID, died 3rd June 1967. Sacred Heart of Jesus have mercy on the soul of PATRICK J. GOLDEN, South Mall, Westport. Died 22nd Jan. 1945, aged 60 years. And his wife BRIDGET, died 4th Sep. 1957, aged 62 years. 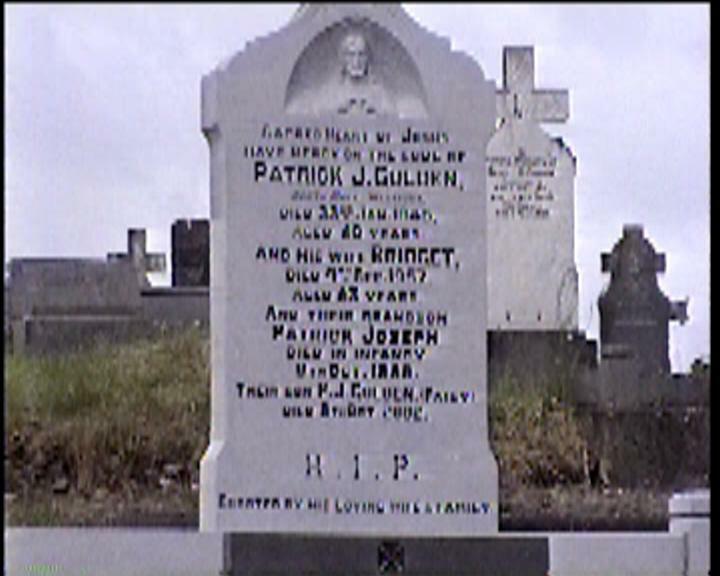 And their grandson PATRICK JOSEPH died in infancy 8th Oct. 1959. Their son P. J, GOLDEN (PATSY) died 8th Oct. 2002. In loving memory of GERARD D. GOLDEN, Sen. Medical Hall, Westport. Died 8th Nov. 1976. 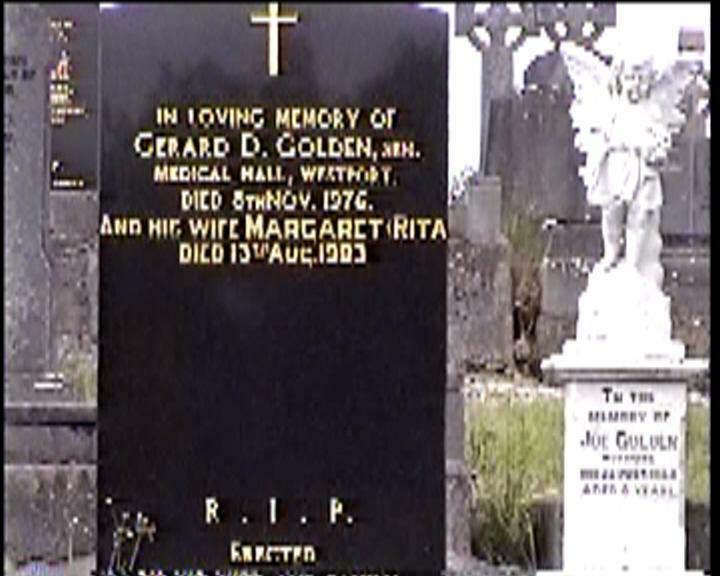 And his wife MARGARET (RITA) died 13th Aug. 1983. To the memory of JOE GOLDEN Westport. Died 26th Oct. 1944 aged 6 years. 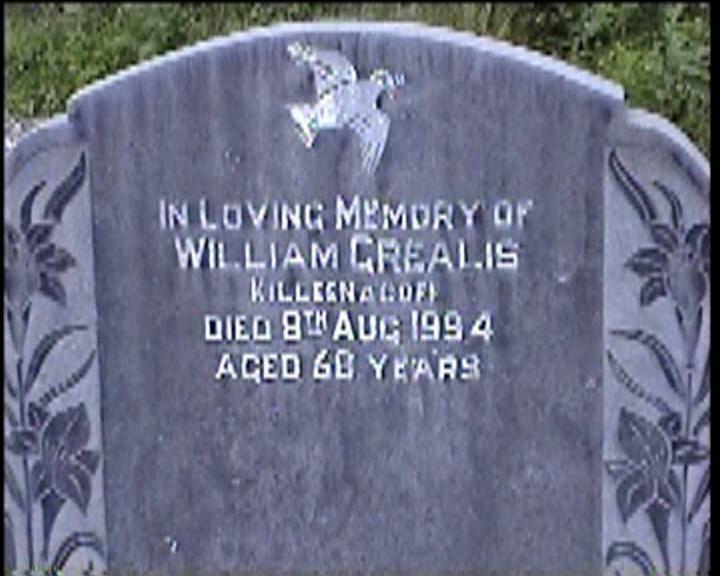 In Loving Memory of WILLIAM GREALIS Killeenacoff died 8th Aug. 1994 aged 68 years. 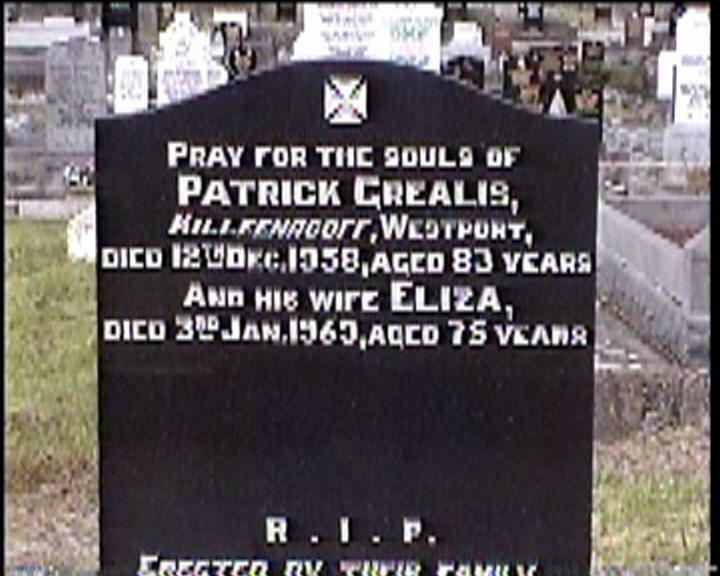 Pray for the souls of PATRICK GREALIS, Killeenacoff, Westport, died 12th Dec. 1958, aged 83 years. And his wife ELIZA, died 3rd Jan. 1969, aged 75 years. In loving memory of GEORGE HASTINGS ? died 13th July 1977 aged 81 years. His wife ELIZABETH died 22nd Oct. 1984 aged 89 years. 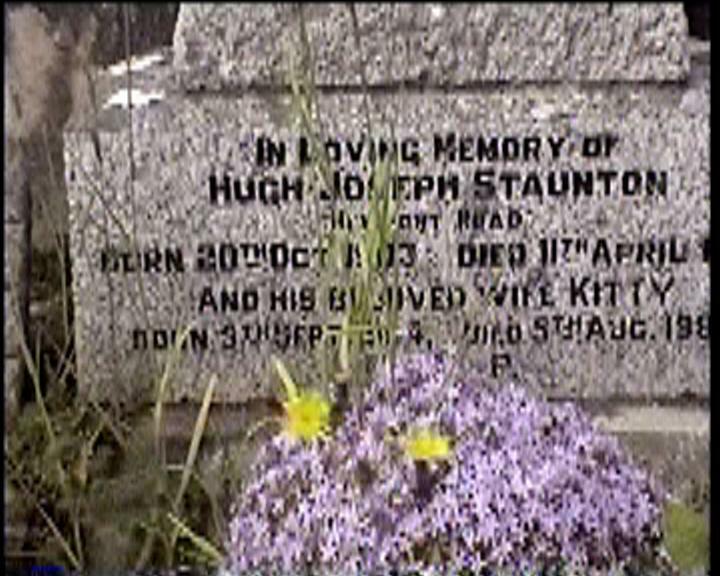 Their daughter KITTY died 10th Aug. 1991 aged 70 years.
? JOYCE died 22 Feb. 1891 aged 15 years. And his father EDWARD JOYCE died Apr ? 1895 aged 56 years. 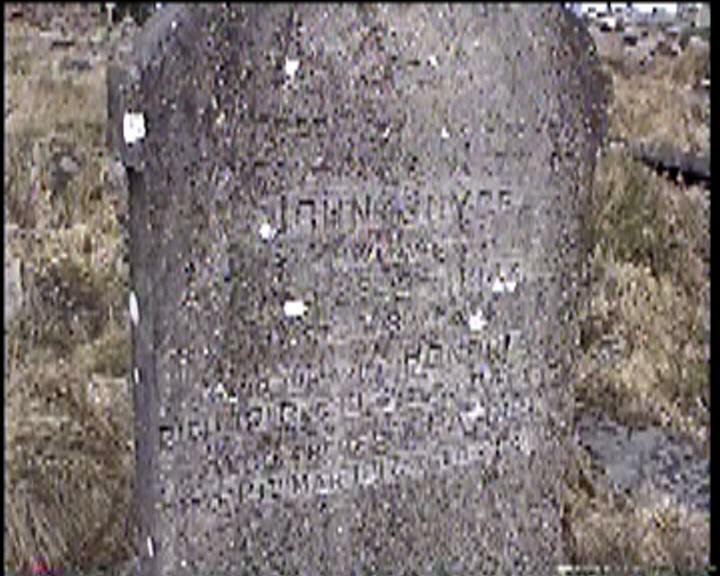 JOHN JOYCE Died 29 19?6. And his wife HONORA died 8th Dec. 1952 aged 84. 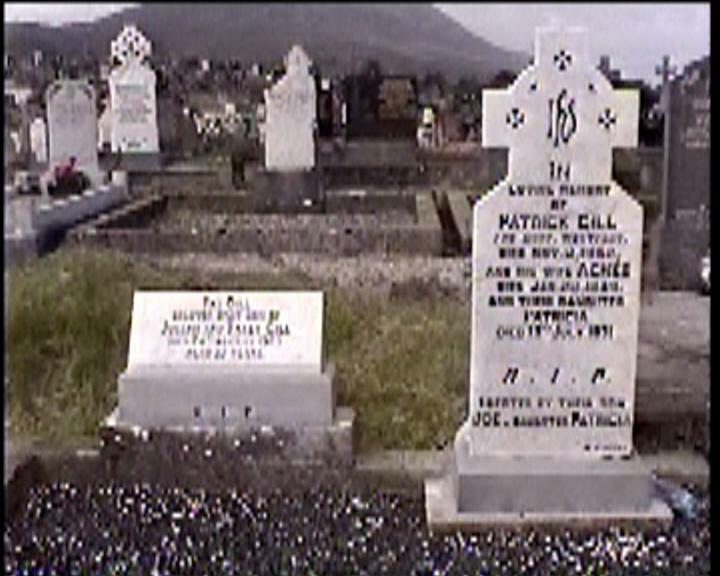 Also their son PATRICK died 19th Mar. 1917 aged ? Lord Have Mercy on the Soul of JOHN KEANE, Supl. C. C. ? who died ? Jan. 1924 aged 20? years. 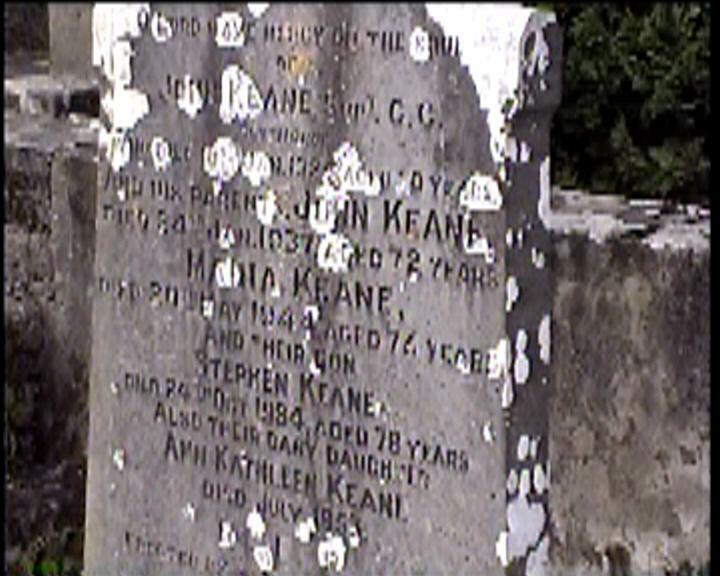 And his parents, JOHN KEANE died 24th Jan. 1937 aged 72 years, MARIA KEANE died 20th May 1944 aged 76 years. 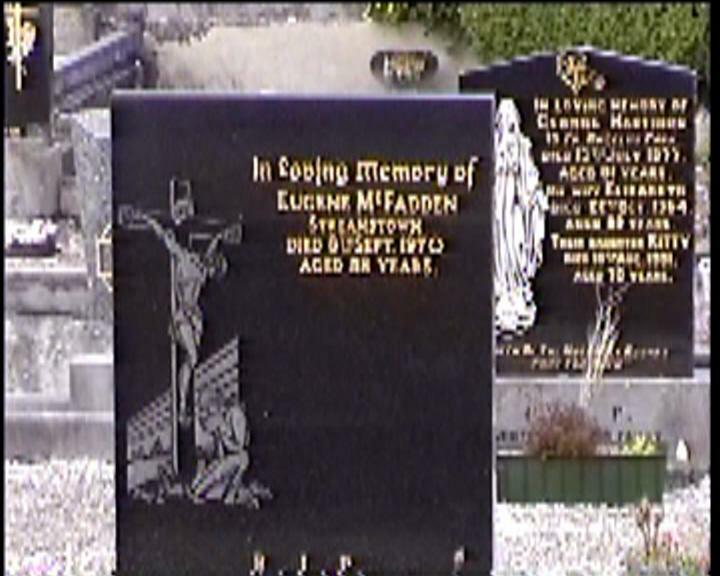 And their son STEPHEN KEANE died 24th Oct. 1984 aged 78 years. 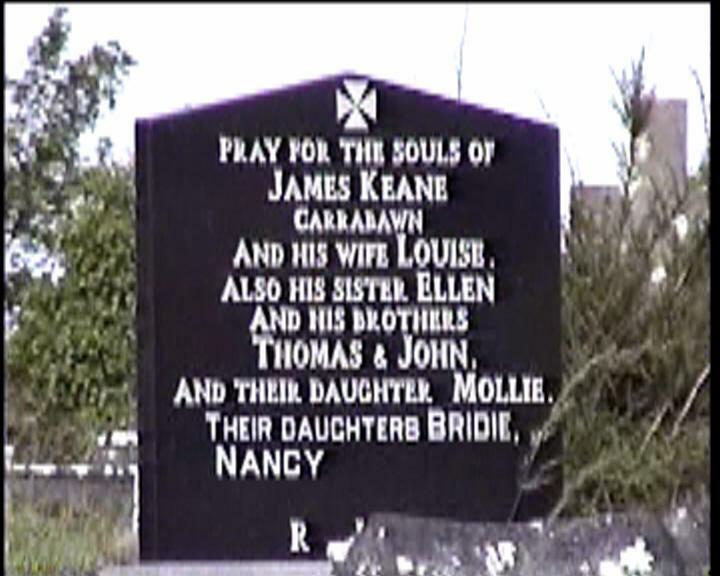 Also their baby daughter ANN KATHLEEN KEANE died July 1953. 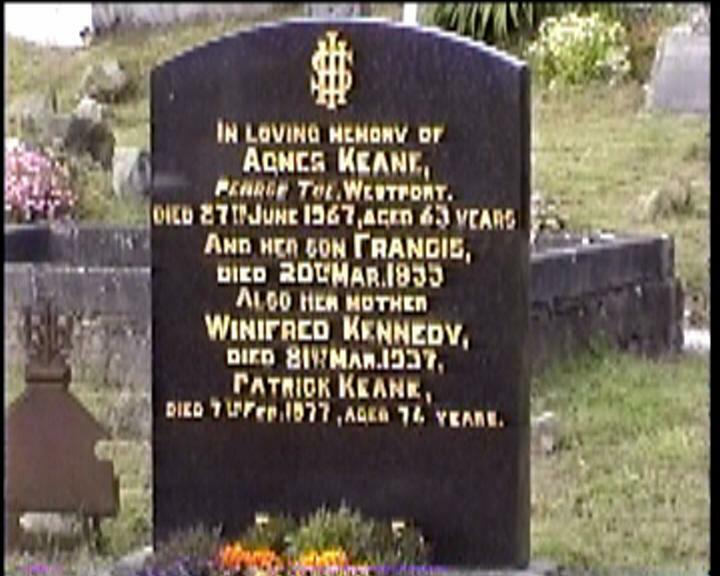 In Loving Memory of AGNES KEANE, Pearse Tce. Westport. Died 27th June 1967, aged 63 years. And her son FRANCIS, died 20th Mar. 1933. 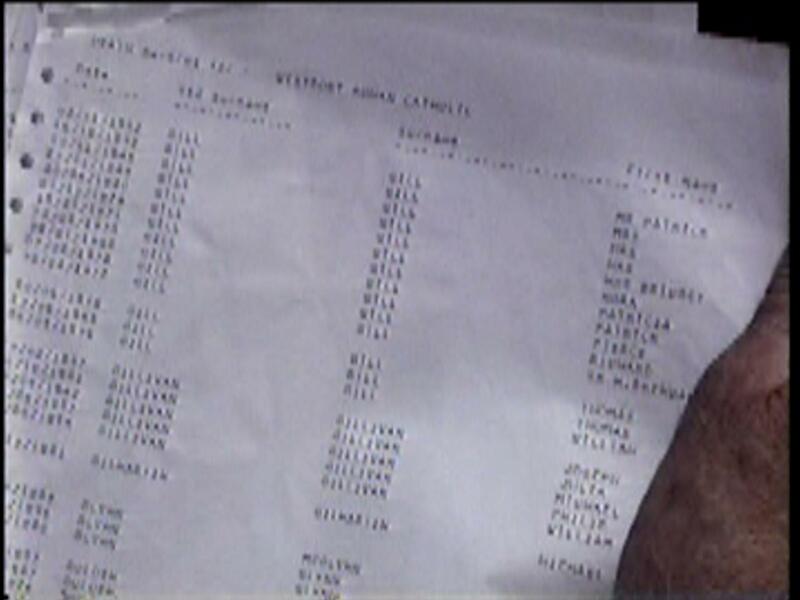 Also her mother WINIFRED KENNEDY, died 21sy Mar. 1937. PATRICK KEANE, died 7th Feb. 1977, aged 76 years. 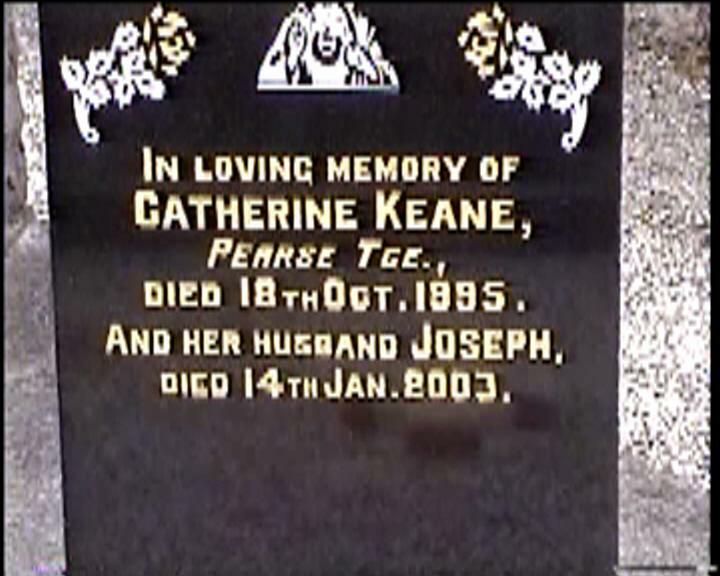 In loving memory of CATHERINE KEANE, Pearse Tce., died 18th Oct. 1995. And her husband JOSEPH died 14th Jan. 2003. 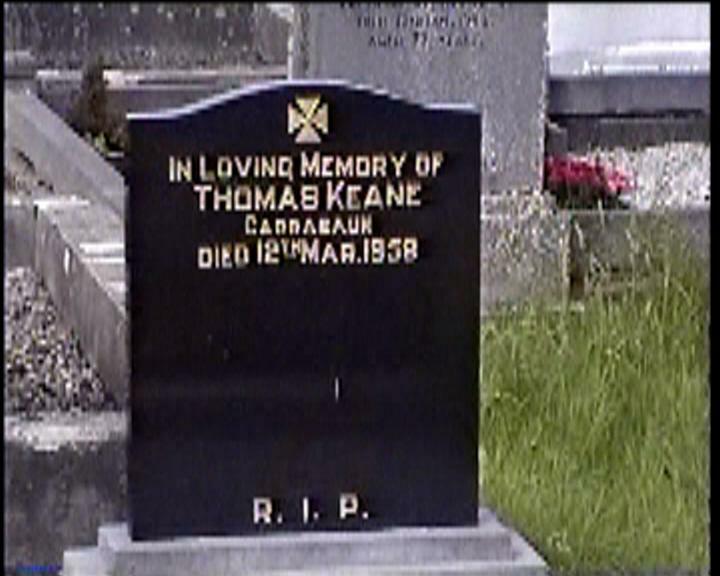 In loving memory of THOMAS KEANE Carrabaun died 12th Mar. 1958. 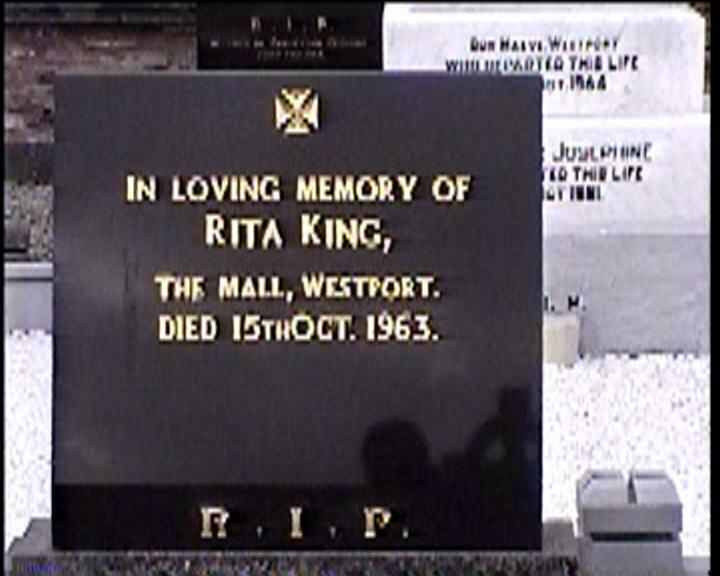 In loving memory of RITA KING, The Mall, Westport. Died 15th Oct. 1963. 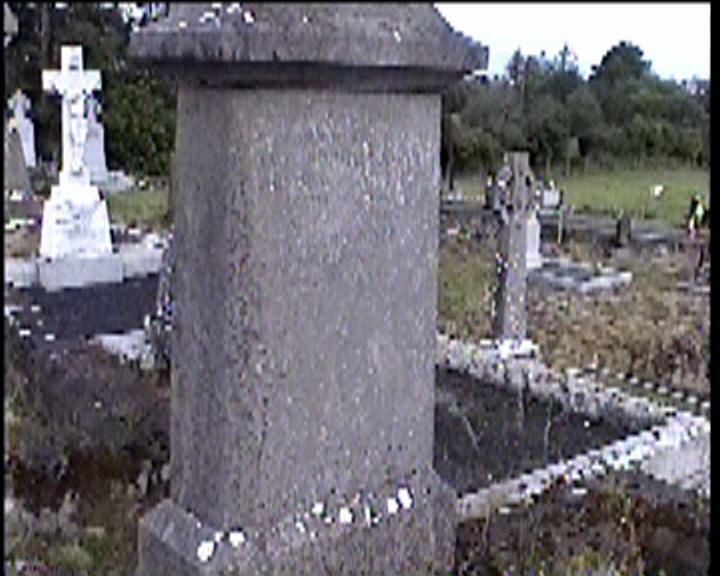 In Memory MICHAEL JOSEPH KING died 15th October 1947 and his wife MAUD KING died 17th August 1943 North Mall, Westport. 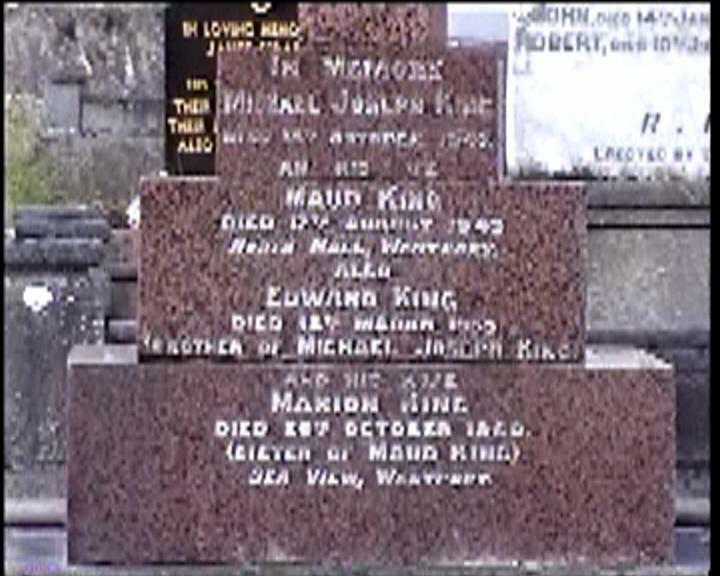 Also EDWARD KING died 1st March 1955 (Brother of Michael Joseph King). And his wife MARION KING died 26th Oct. 1960. (Sister of Maud King) Sea View, Westport. 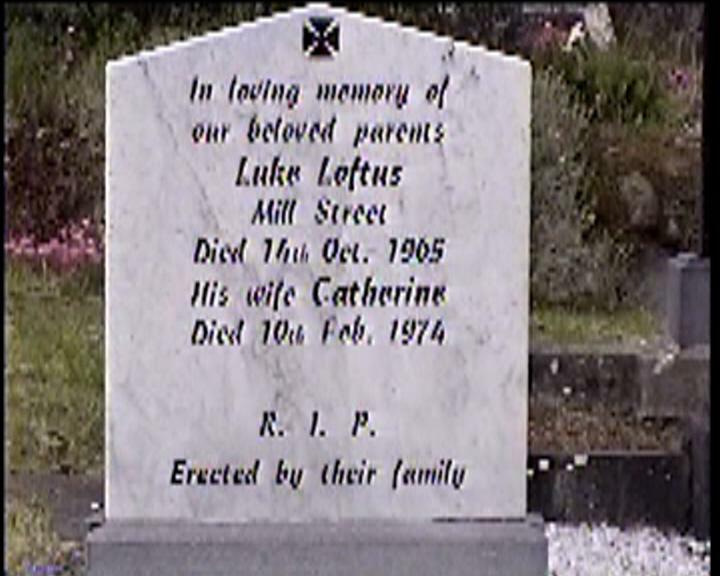 In loving memory of our beloved parents LUKE LOFTUS Mill Street Died 14th Oct. 1965. His wife CATHERINE died 10th Feb. 1974. 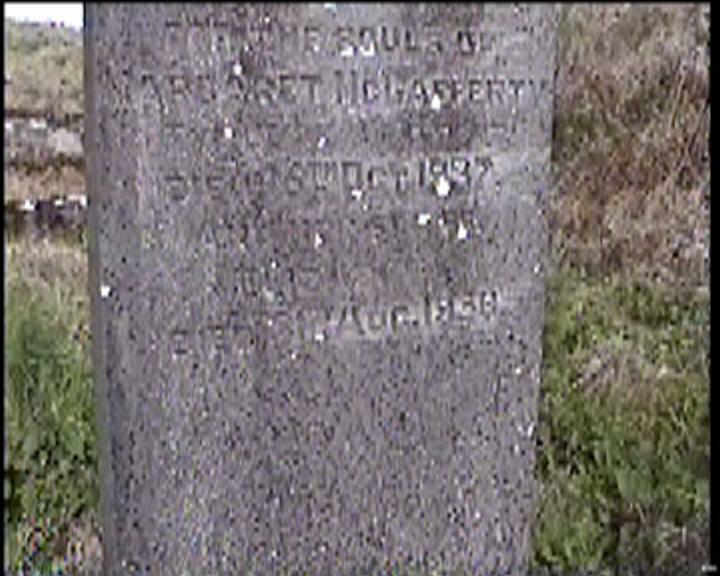 Pray for the souls of MARGARET MCCAFFERTY died 16th Oct. 1937. And her daughter Elizabeth Died 31st Aug. 1939. 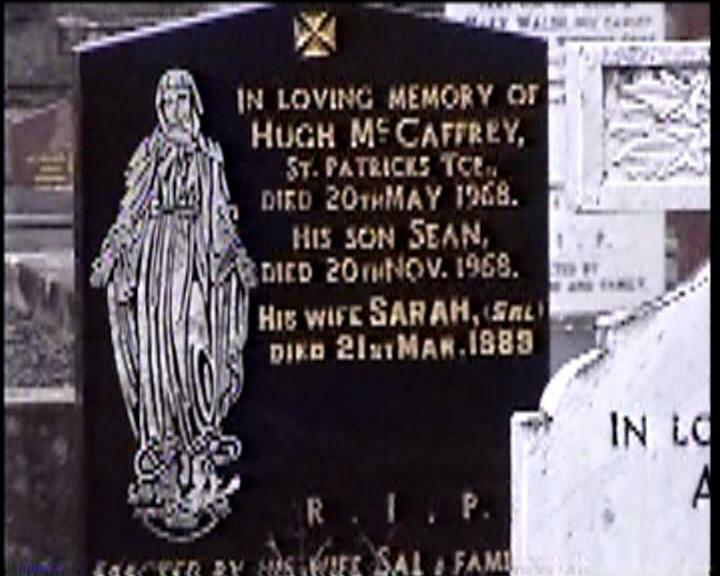 In loving memory of HUGH MCCAFFREY, St. Patricks Tce., died 20th May 1968. His son SEAN, died 20th Nov. 1968. His wife SARAH, (SAL) died 21st Mar. 1989. 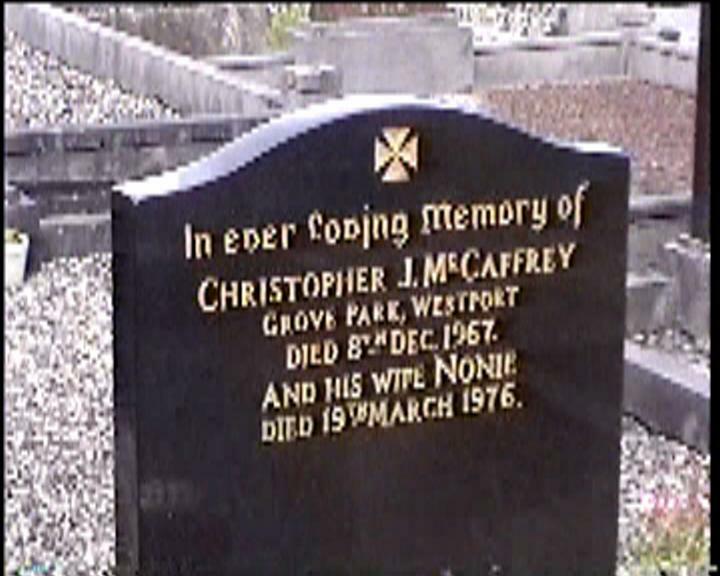 In ever loving memory of CHRISTOPHER J. MCCAFFREY Grove Park, Westport. Died 8th Dec. 1967. And his wife NONIE died 19th March 1976. 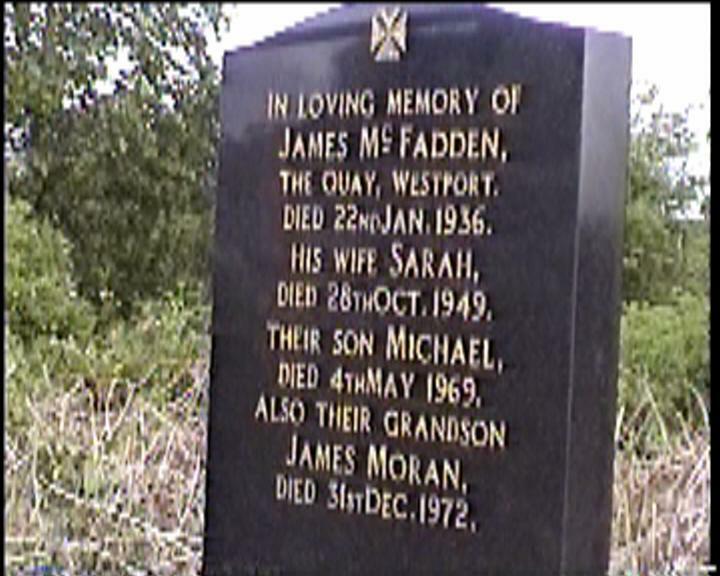 In Loving Memory of JAMES MCFADDEN, The Quay, Westport. Died 22nd Jan. 1936. His wife SARAH, died 28th Oct. 1949. 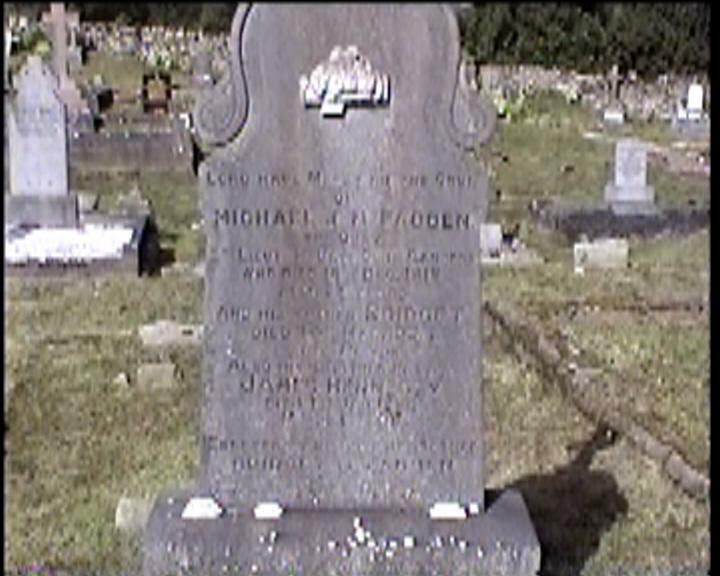 Their son MICHAEL, died 4th May 1969. 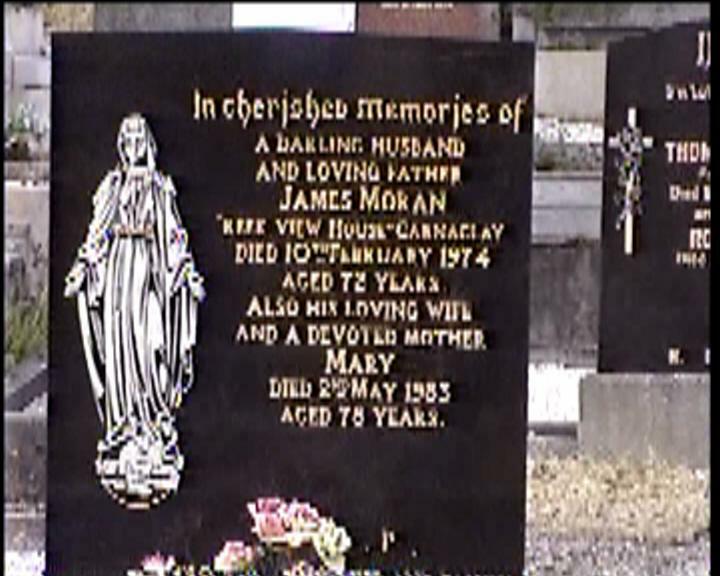 Also their grandson JAMES MORAN, died 31st Dec. 1972. In Loving Memory of BRIDGET MCFADDEN (nee FERGUS) Streamstown. 1876-1938. Her husband MARTIN, 1881-1963. Their infant daughter MARY. And all who rest in this grave. 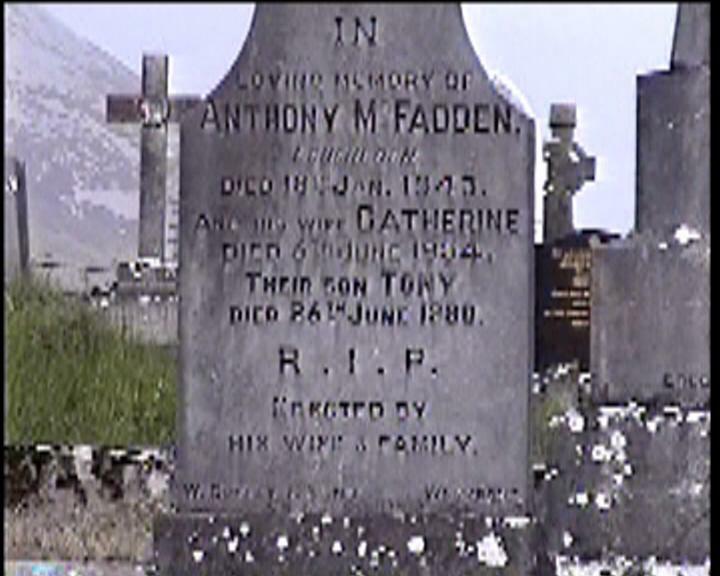 In Loving Memory of ANTHONY MCFADDEN, Loughloon, died 18th Jan. 1943. And his wife CATHERINE died 6th June 1954. Their son TONY died 26th June 1990. In loving memory of EUGENE MCFADDEN Streamstown. Died 8th Sept. 1970 aged 58 years. 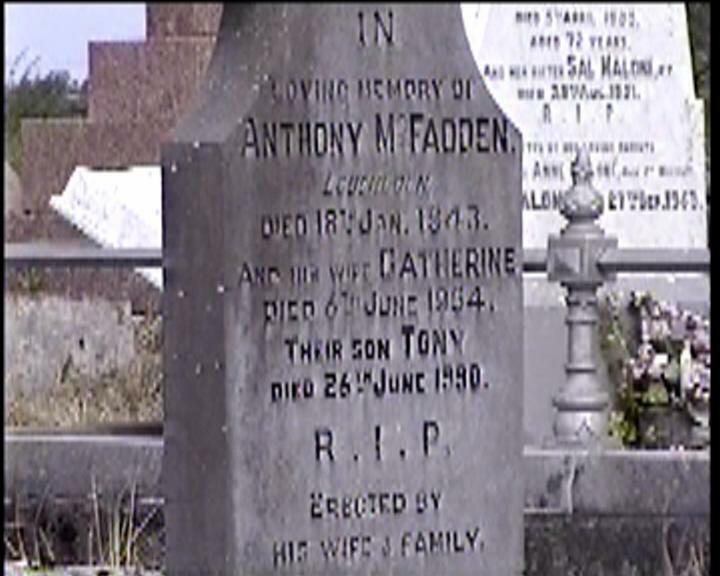 In loving memory of ANTHONY MCFADDEN, Loughloon died 18th Jan. 1943. And his wife CATHERINE died 6th June 1954. Their son TONY died 26th June 1990. 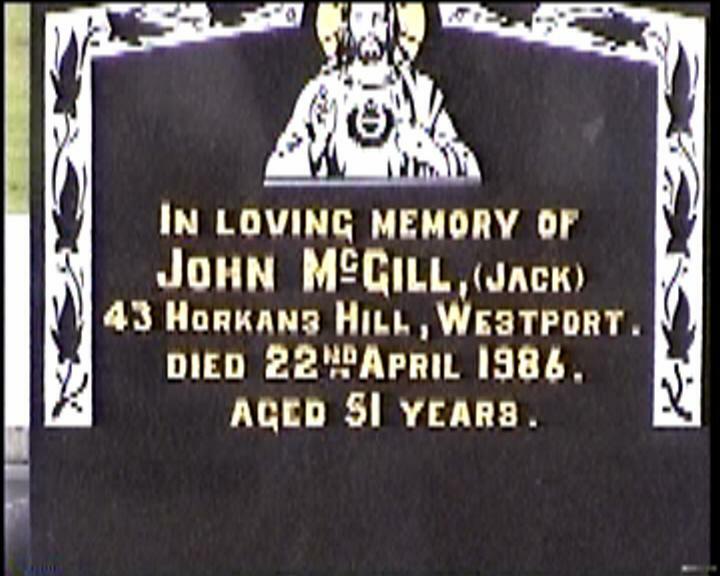 In loving memory of JOHN MCGILL, (JACK) 43 Horkans Hill, Westport. 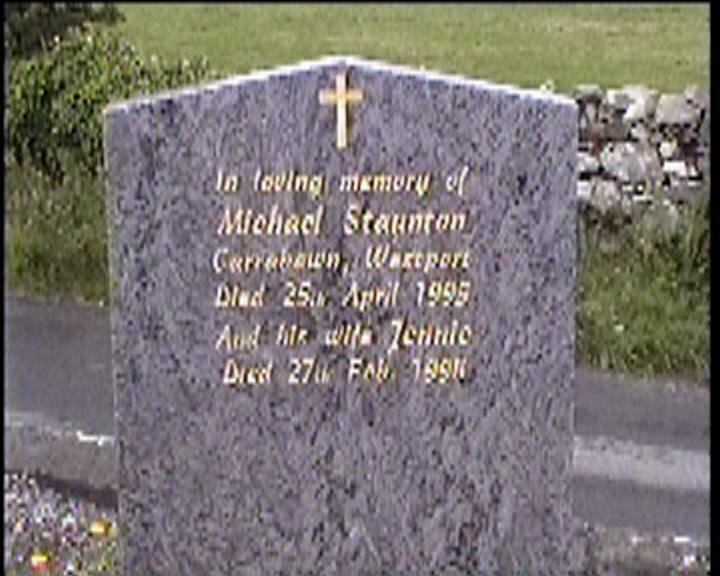 Died 22nd April 1986. Aged 51 years. 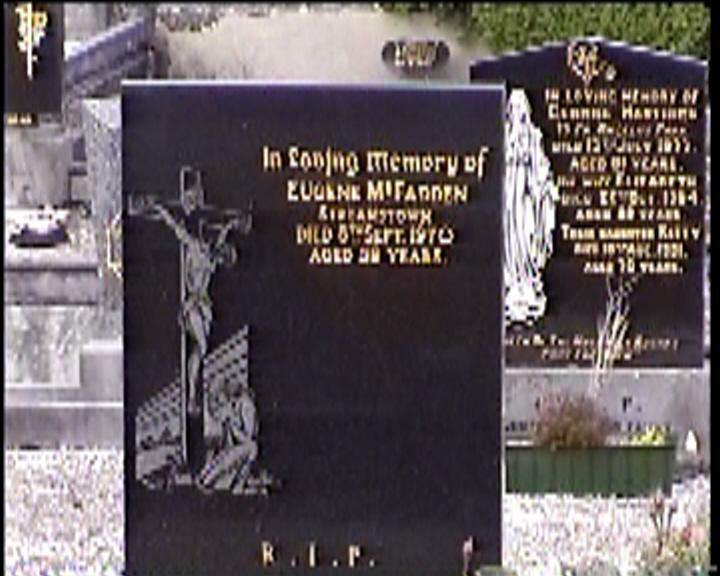 In loving memory of MARGARET MCGREAL died 12th Feb 1987. 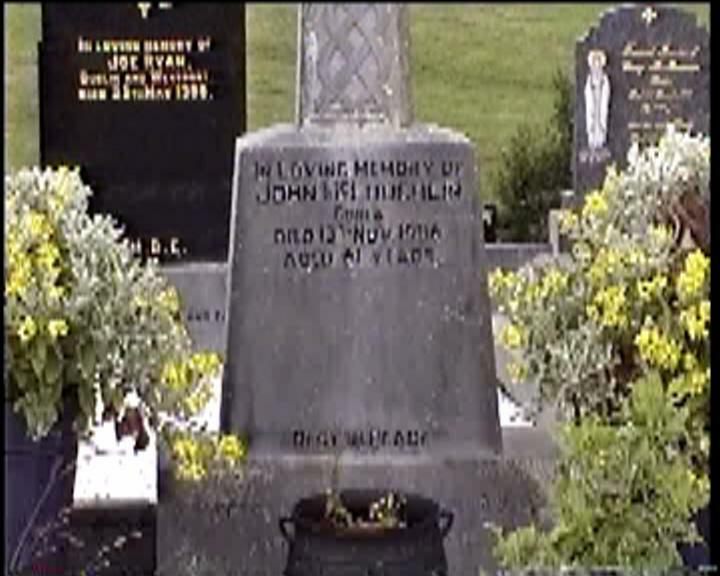 And her husband MARTIN JOHN died 14th May 2000. In loving memory of JOHN MCLOUGHLIN Sonea. Died 13th Nov. 1986 aged 61 years. 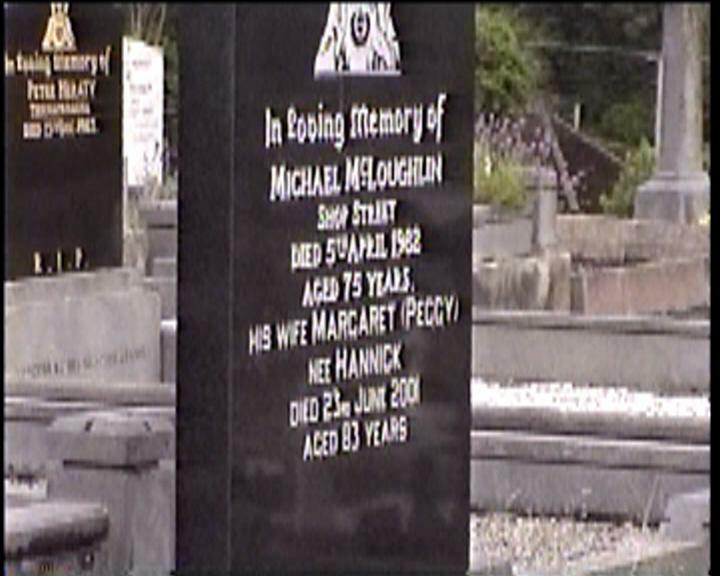 In loving memory of MICHAEL MCLOUGHLIN Shop Street died 5th April 1982 aged 75 years. His wife MARGARET (PEGGY) nee HANNICK died 23rd June 2001 aged 83 years. 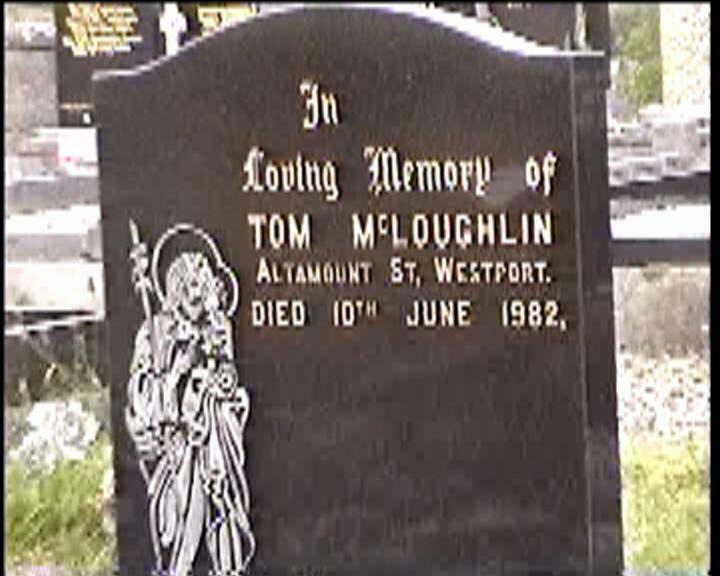 In loving memory of TOM MCLOUGHLIN Altamount St. Westport. Died 10th June 1982. In loving memory of HUGH MCLOUGHLIN The Quay. Died 22nd Jan. 1980. 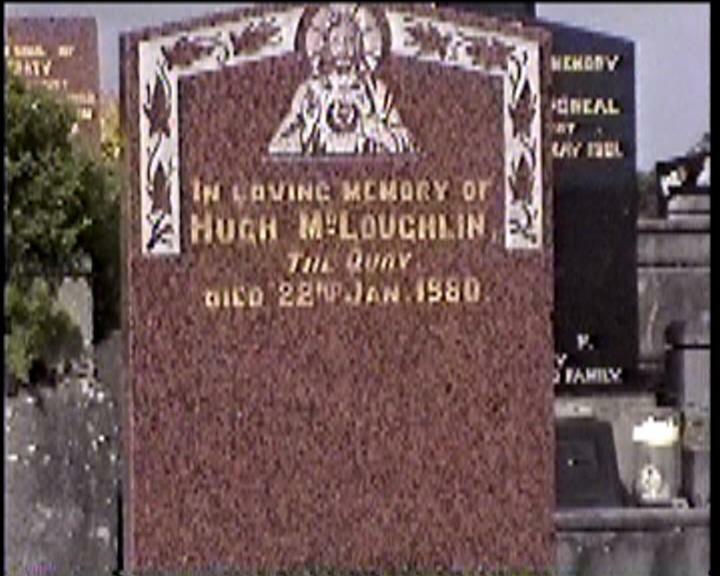 IN loving memory of THOMAS MCLOUGHLIN Pohea Died 10th Jan. 1973 aged 68 years. And his wife MAMIE died 6th Mar. 1996. 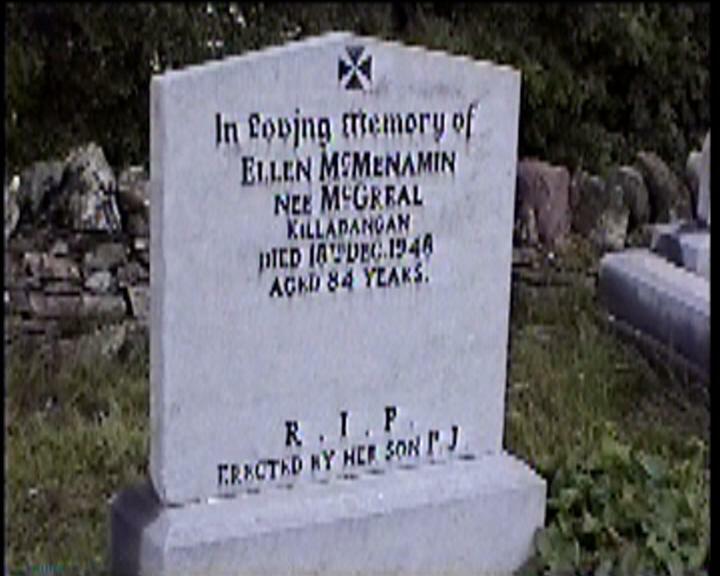 In Loving Memory of ELLEN MCMENAMIN Nee MCGREAL, Killadangan. Died 18th Dec. 1948 aged 84 years. Erected by her son P. J. 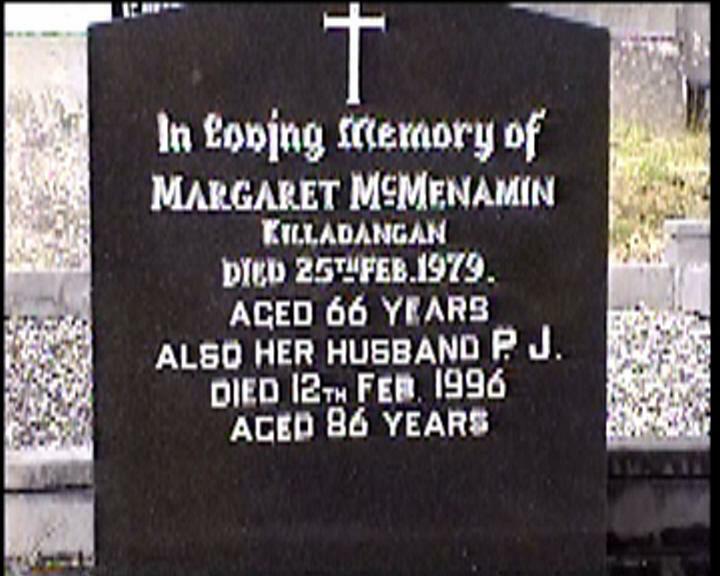 In loving memory of MARGARET MCMENAMIN Killadangan. Died 25th Feb. 1979. Aged 66 years. Also her husband P. J. died 12th Feb. 1996 aged 86 years. 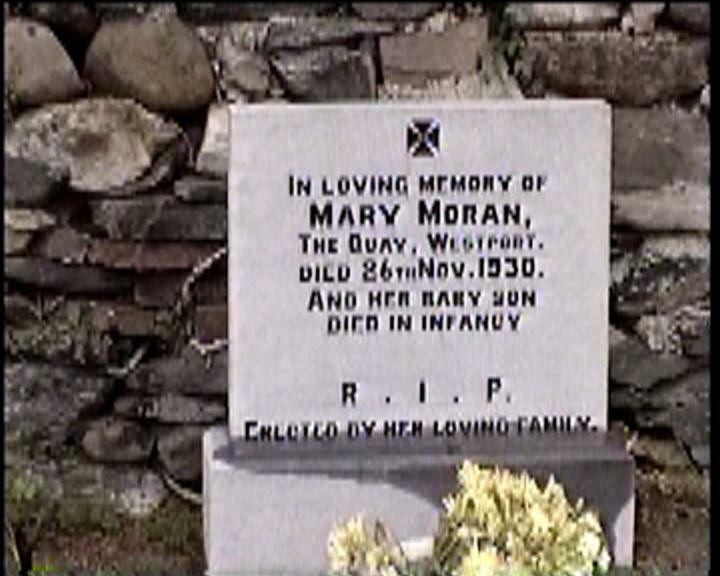 In Loving Memory of MARY MORAN, The Quay, Westport. Died 26th Nov. 1930. And her baby son died in infancy. DELIA K. MORAN who died 18 Jan 1878 aged 27 years. And her BERNARD J. MORAN, daughter AMY MORAN died Aug. 8, 1957. 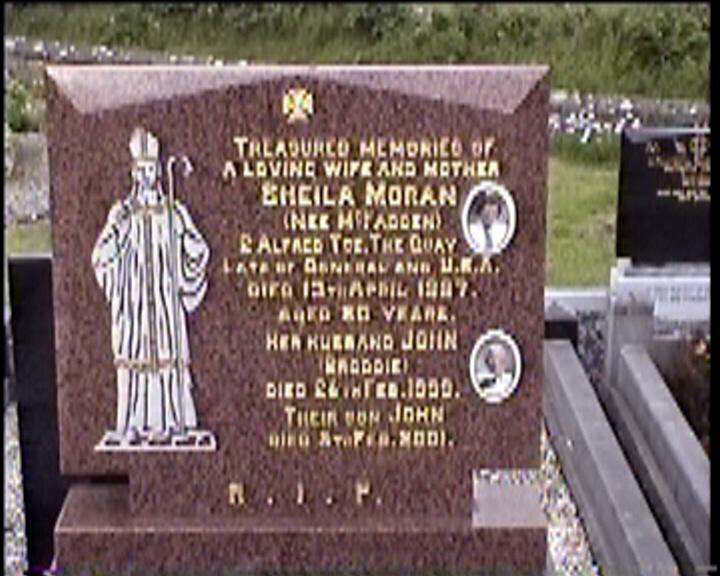 Treasured memories of a loving wife and mother SHEILA MORAN (nee MCFADDEN) 2 Alfred Tce, The Quay, late of Donegal and U.S.A. Died 13th April 1987 aged 80 years. Her husband JOHN (BRODDIE) died 26th Feb. 1998. 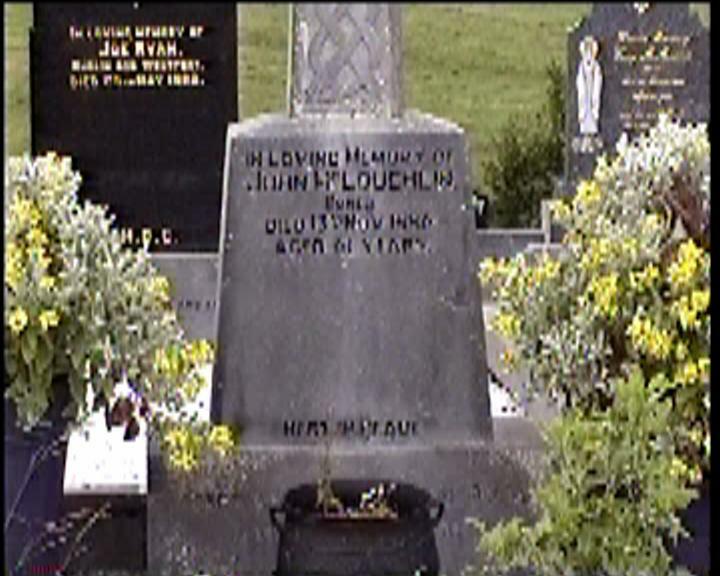 Their son JOHN died 5th Feb. 2001. In loving memory of MARY MORAN, (Ciss) Bridge St., Westport. Died 11th Jan. 1986. 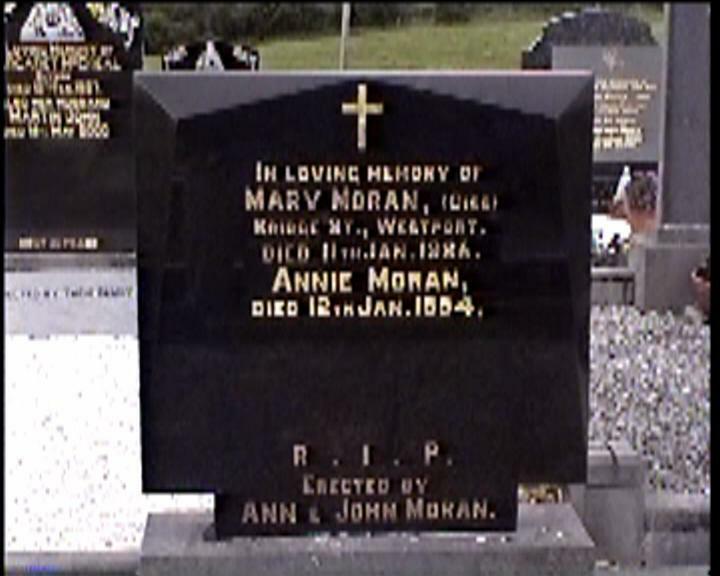 ANNIE MORAN, died 12th Jan. 1994. Erected by Ann and John Moran. In loving memory of MARY MORAN Killeenacoff. Died 19th Feb. 1984 aged 74 years. 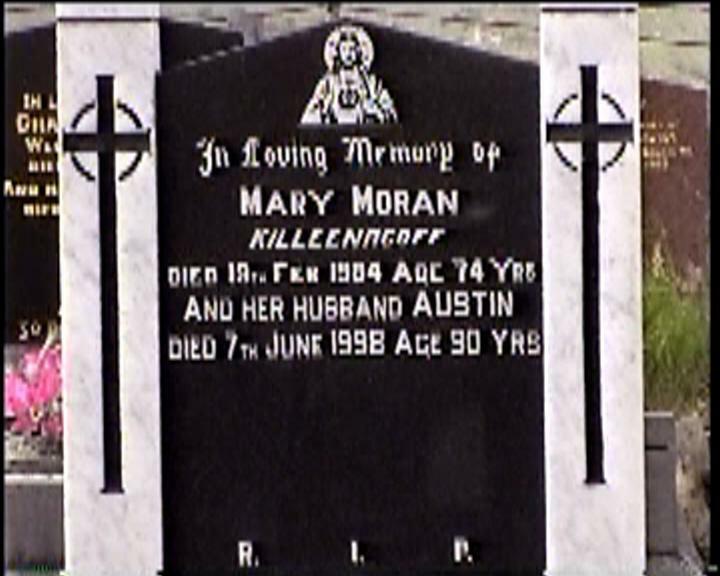 And her husband AUSTIN died 7th June 1998 age 90 yrs. 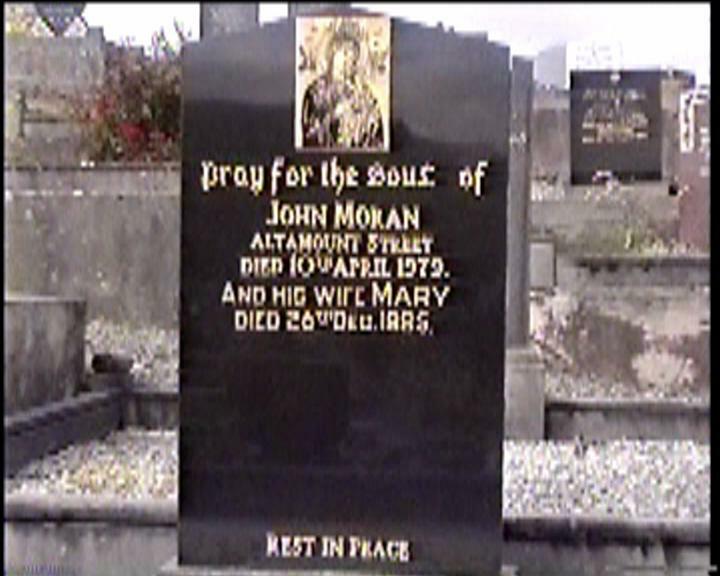 Pray for the soul of JOHN MORAN Altamount Street. Died 10th April 1979. And his wife MARY died 26th Dec. 1985. In loving memory of WILLIAM MORAN, Revenue Row, The Quay, Westport. Died 2nd Dec. 1978, aged 50 years. 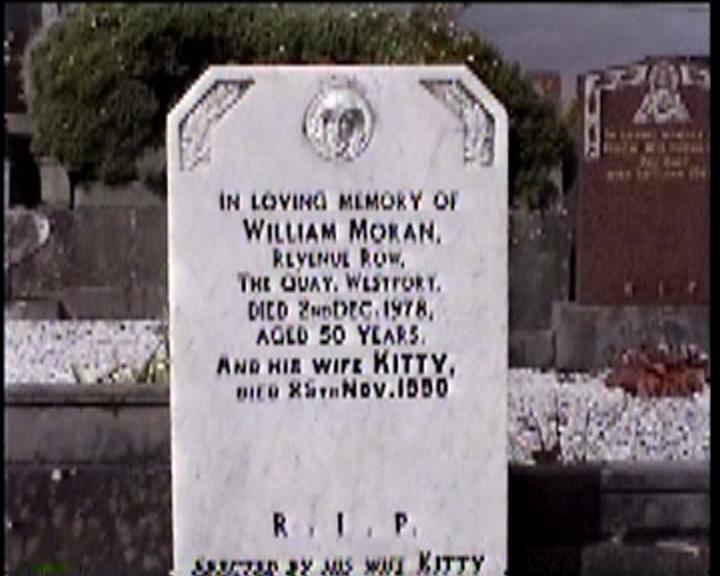 And his wife KITTY, died 25th Nov. 1990. In cherished memories of a darling husband and loving father JAMES MORAN “Reek View House” Carnaclay. Died 10th February 1974 aged 72 years. Also his loving wife and a devoted mother MARY died 2nd May 1983 aged 78 years. 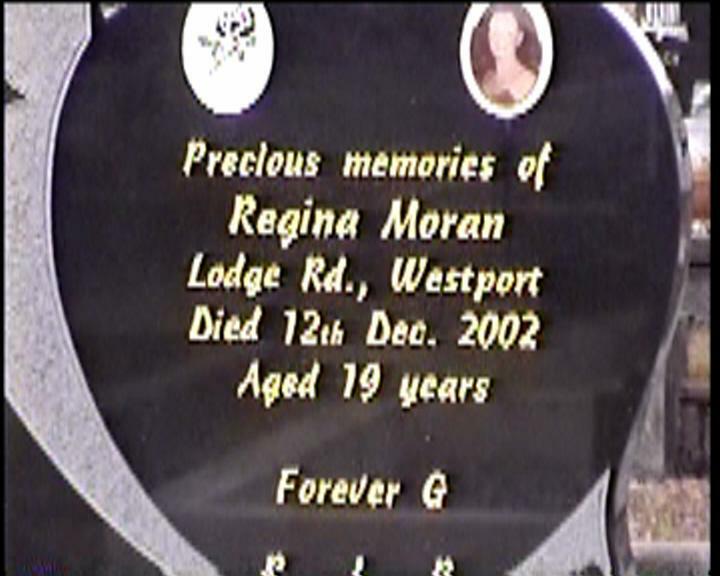 Precious memories of REGINA MORAN Lodge Rd., Westport. Died 12th Dec. 2002 Aged 19 years. 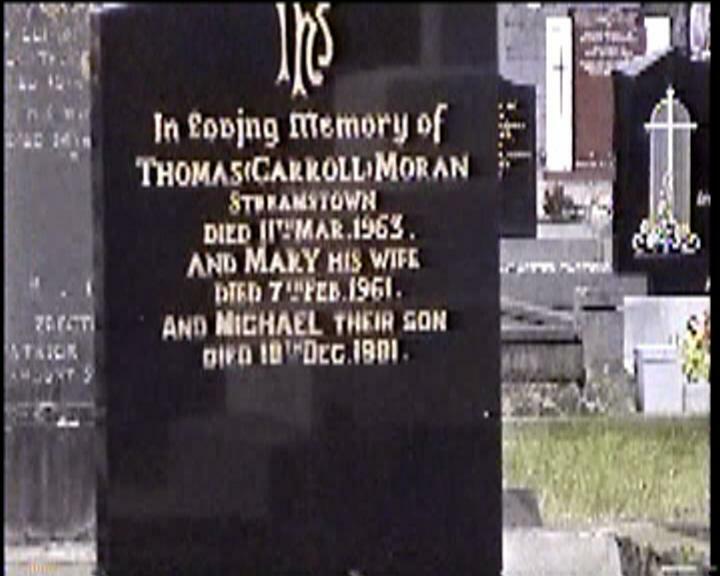 In loving memory of THOMAS (CARROLL) MORAN Streamstown, Died 11th Mar. 1963. And MARY his wife died 7th Feb. 1961. And MICHAEL their son died 18th Dec. 1981. 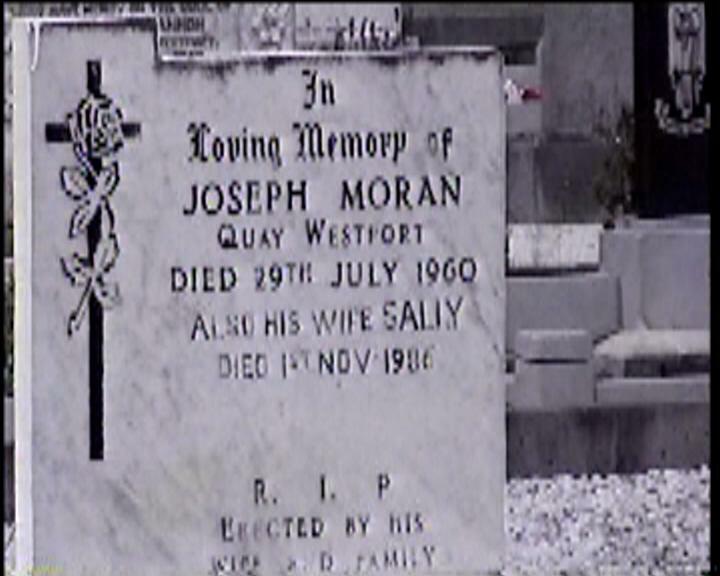 In loving memory of JOSEPH MORAN Quay Westport Died 29th July 1960. Also his wife SALLY died 1st Nov. 1986. 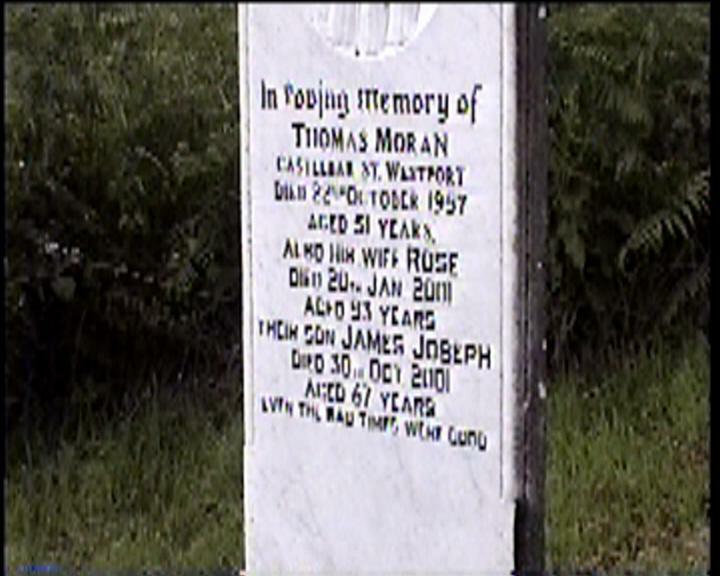 In loving memory of THOMAS MORAN Pearse Terrace, Westport. Died 2nd Feb. 1961. 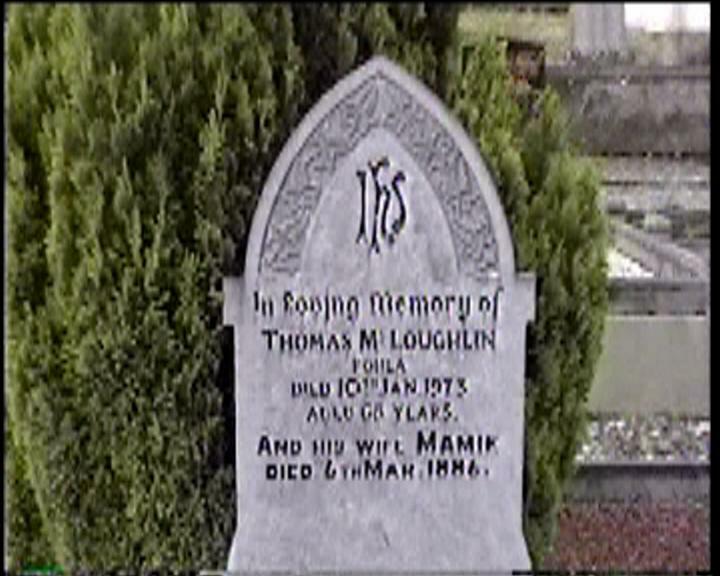 His son in law TOM MCDONAGH, St. Mary’s Cresent, Westport. Died 23rd March 1992, aged 69 years. 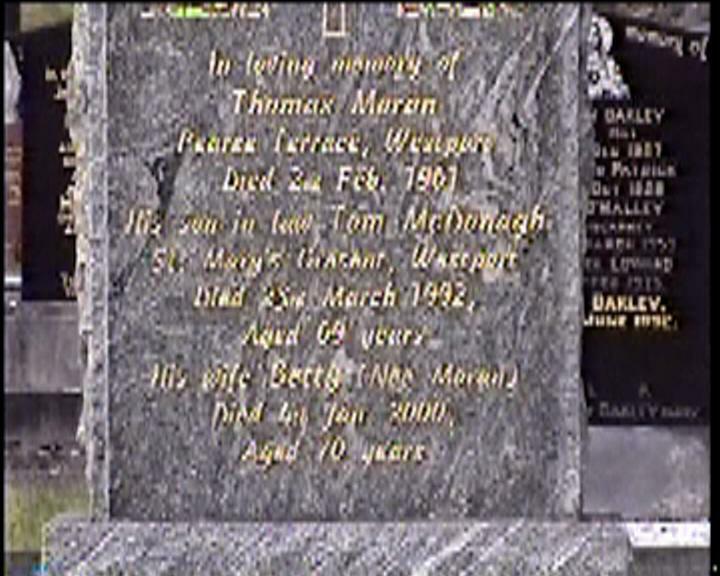 His wife BETTY (nee MORAN) Died 4th Jan. 2000, aged 70 years. 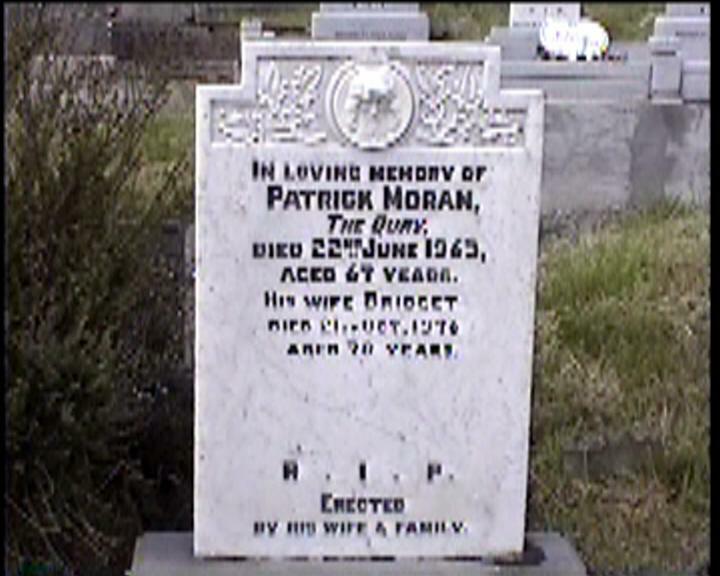 In loving memory of PATRICK MORAN The Quay, died 22nd June 1963, aged 67 years. 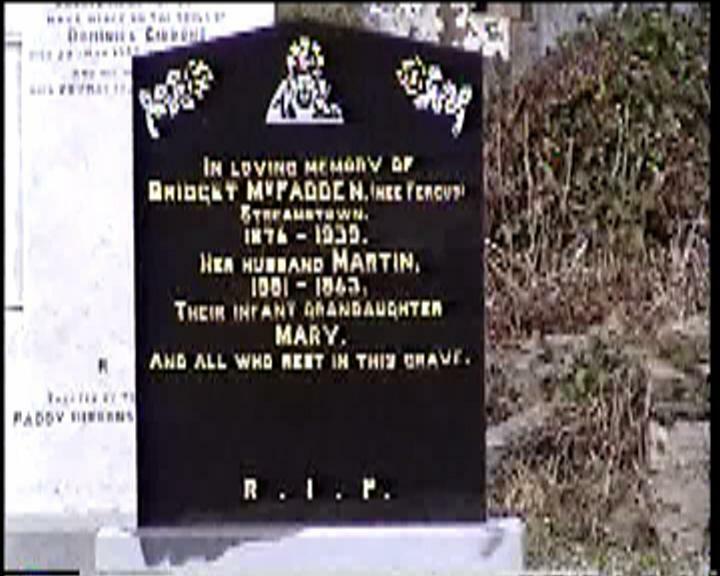 His wife BRIDGET died 21st Oct. 1976 aged 78 years. 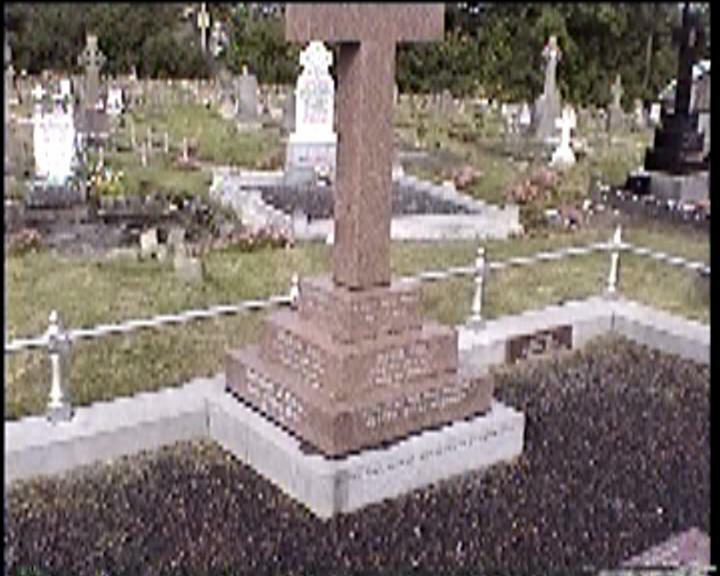 Sacred Heart of Jesus Have Mercy on the Soul of THOMAS MULCHRONE, Westport, who died 8th March 1940 aged 63 years. And his wife TERESA died 2nd Mar. 1972 aged 94 years. 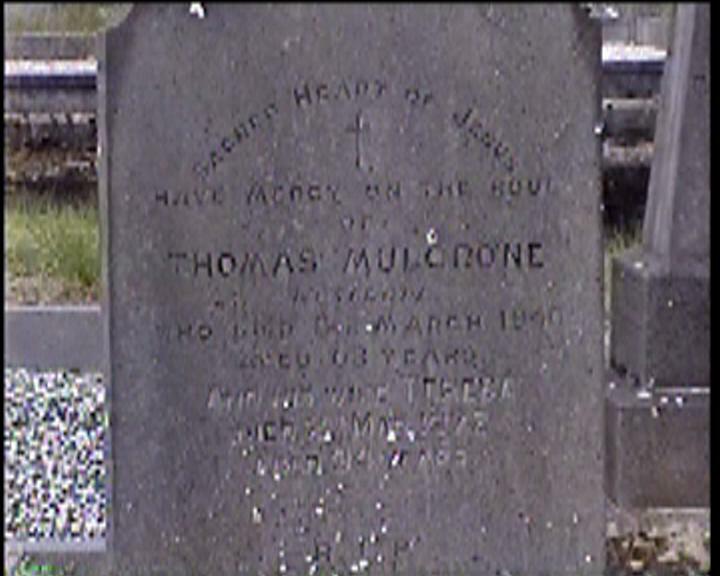 Sacred Heart of Jesus have mercy on the soul of THOMAS MULCRONE Westport, who died 8th March 1940 aged 63 years. And his wife TERESA died 24th Mar. 1972 aged 94 years. 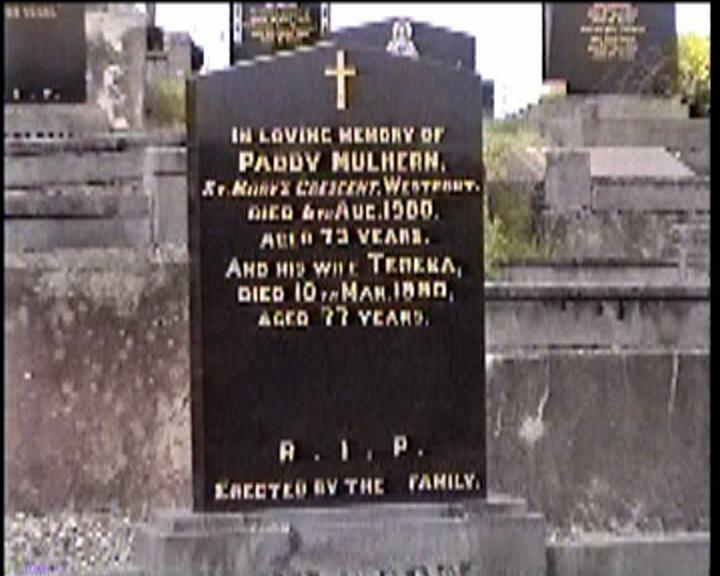 In loving memory of PADDY MULHERN, St. Mary’s Crescent, Westport. Died 6th Aug. 1980. Aged 73 years. And his wife TERESA died 10th Mar. 1990 aged 77 years. 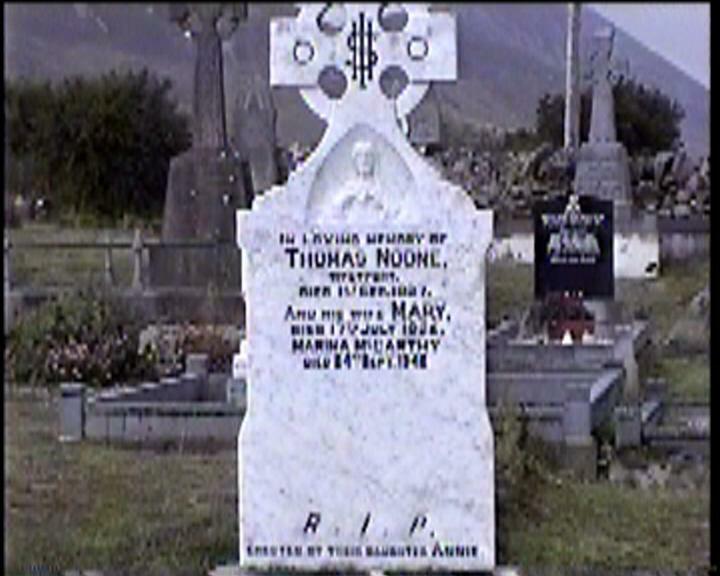 In Loving Memory of THOMAS NOONE, Westport, died 1st Sep. 1927 . And his wife MARY, died 17th July 1956. MARINA MCCARTHY died 24th Sept. 1942. 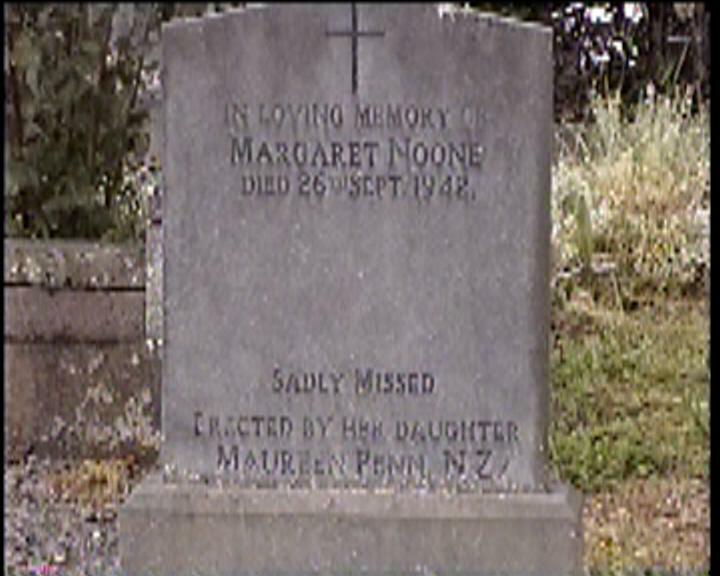 In loving memory of MARGARET NOONE died 26th Sept. 1942.. Sadly missed by her daughter MAUREEN PENN. 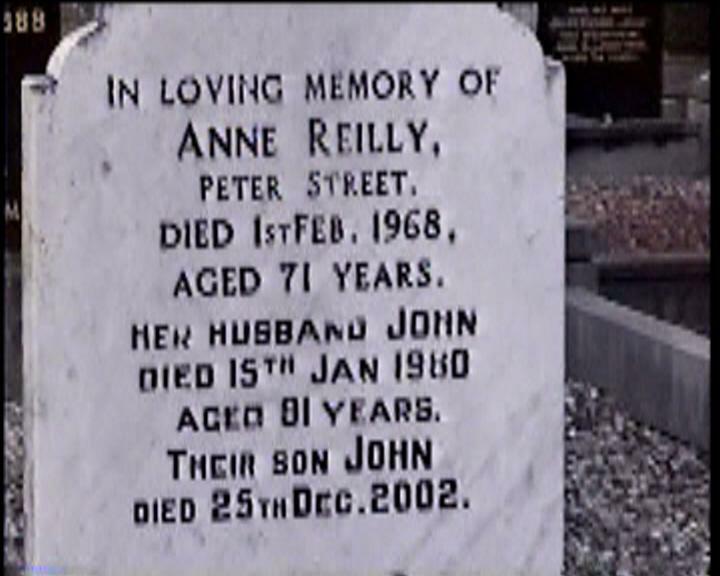 In loving memory of ANNE REILLY, Peter Streeet. Died 1st Feb. 1968, aged 71 years. Her husband JOHN died 15th Jan 1980 aged 81 years. 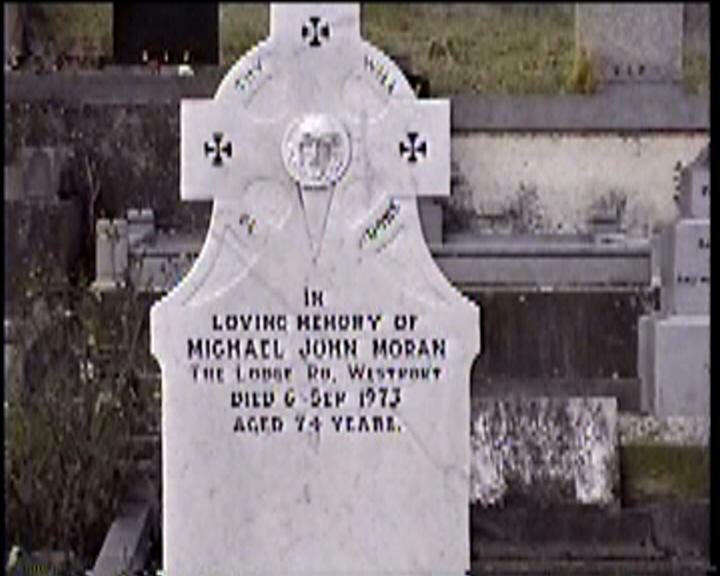 Their son JOHN died 25th Dec. 2002. 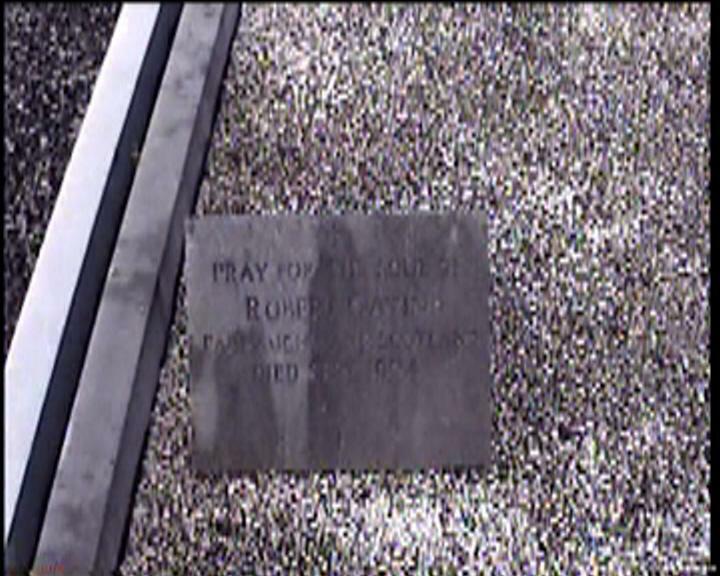 Pray for the soul of ROBERT STAUNTON, died 20 Oct. 1885 aged 52 years. 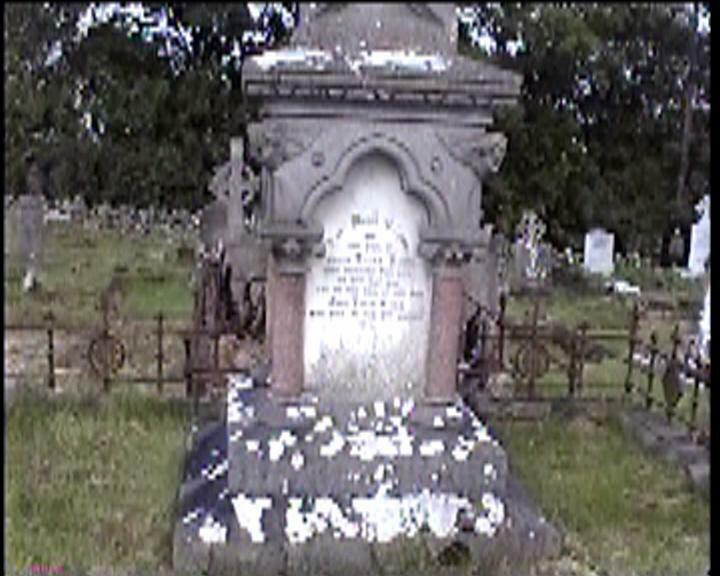 And his sister BRIDGET STAUNTON died 23 Dec. 1876 aged 40 years. 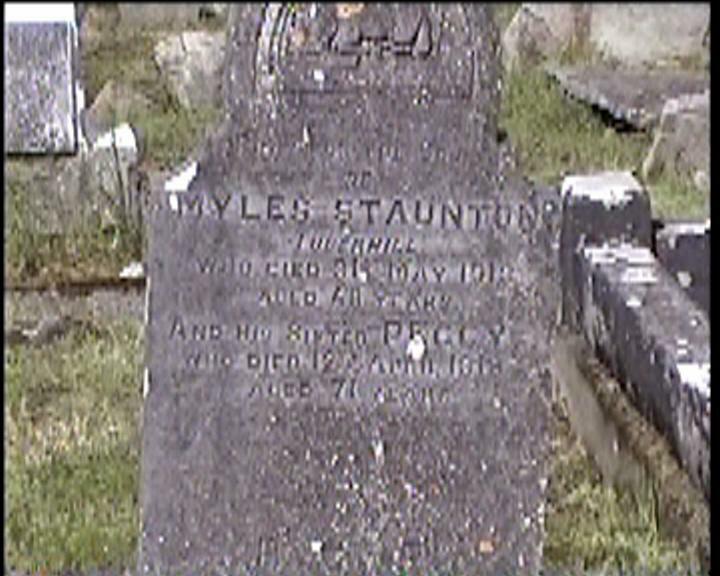 Lord Have Mercy on the soul of MYLES STAUNTON, Tuberhill, who died 31st May 1918 aged 68 years. And his sister PEGGY who died 12 April 1919 aged 71 years. 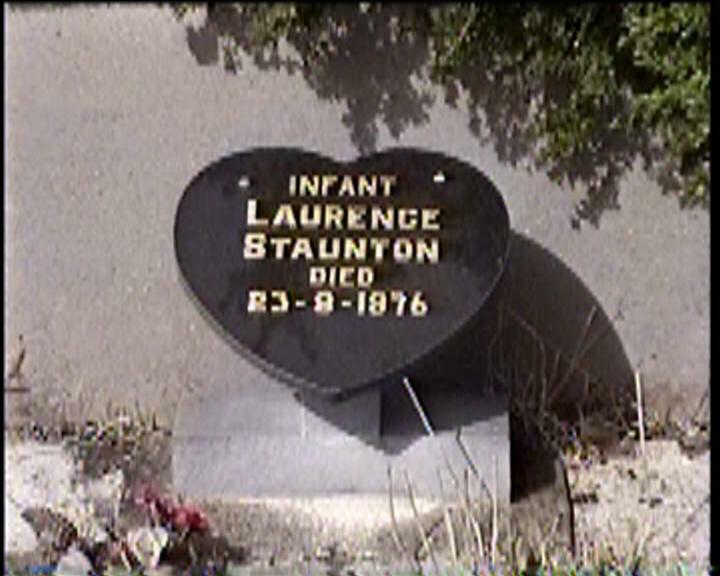 Infant LAURENCE STAUNTON died 23-8-1976. 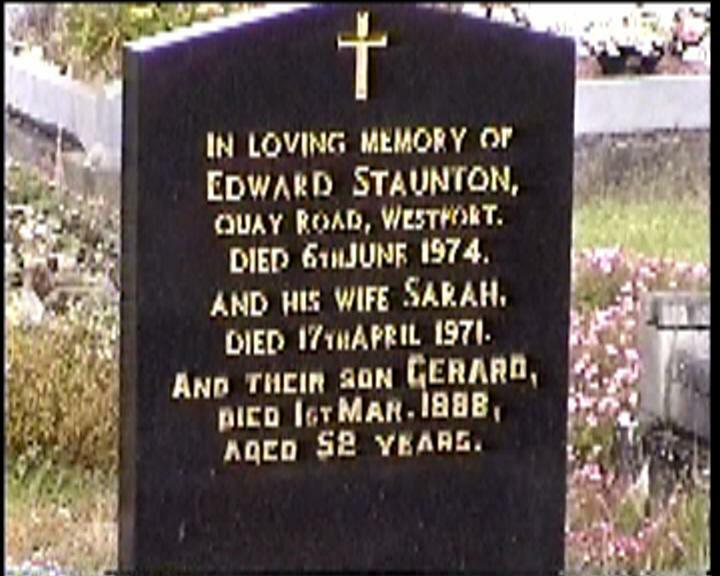 In loving memory of EDWARD STAUNTON, Quay Road, Westport. Died 6th June 1974. And his wife SARAH, died 17th April 1971. And their son GERARD, died 1st Mar. 1998, aged 52 years. 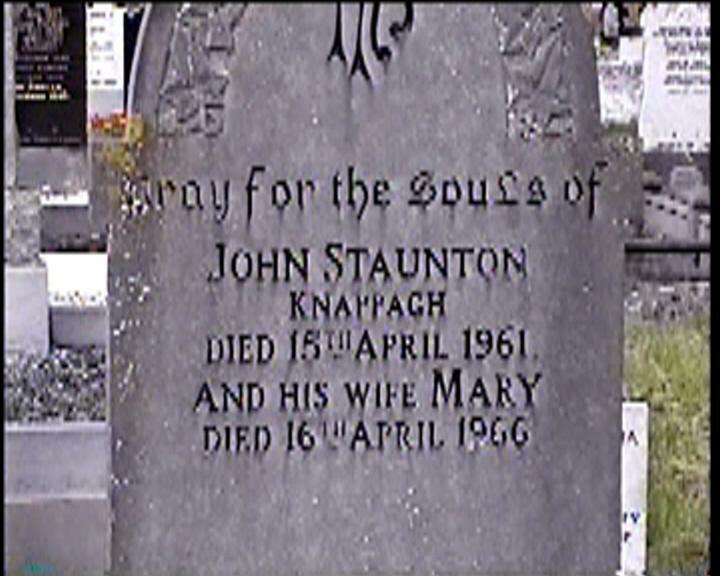 Pray for the souls of JOHN STAUNTON Knappagh Died 15th April 1961, and his wife MARY died 16th April 1966. 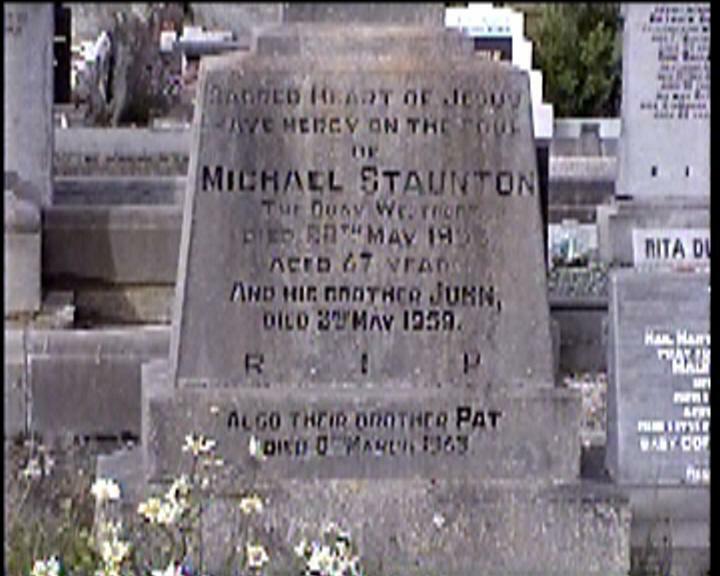 Sacred Heart of Jesus have mercy on the soul of MICHAEL STAUNTON The Quay, Westport. Died 28th May 1953 aged 67 years. And his brother JOHN, died 25th May 1959. Also their brother PAT died 8th March 1969.